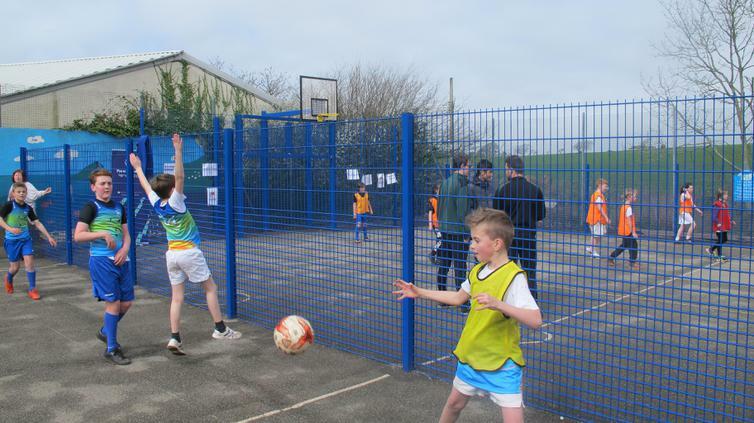 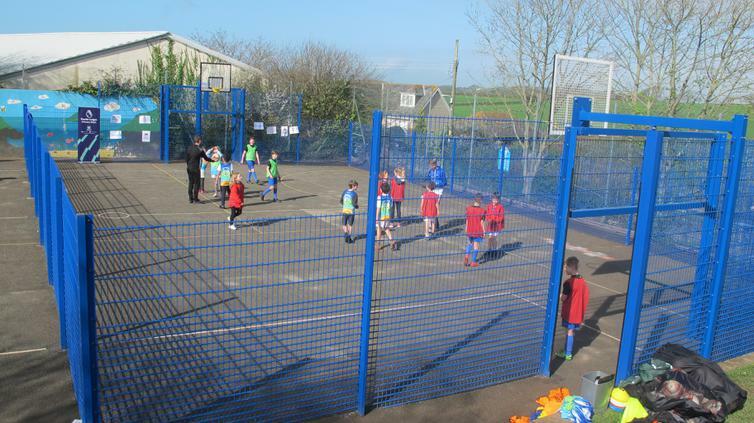 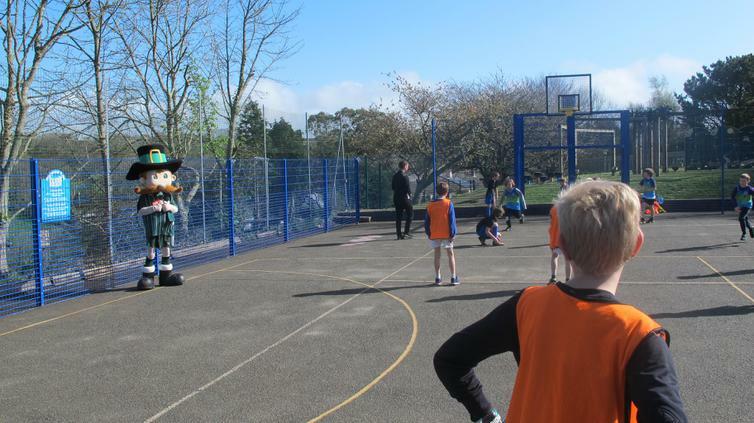 A fitting end to an eventful term yesterday, with the official opening of the playground MUGA. 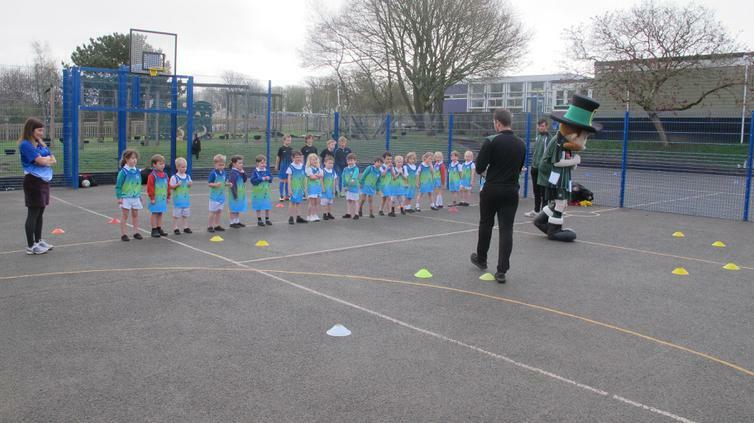 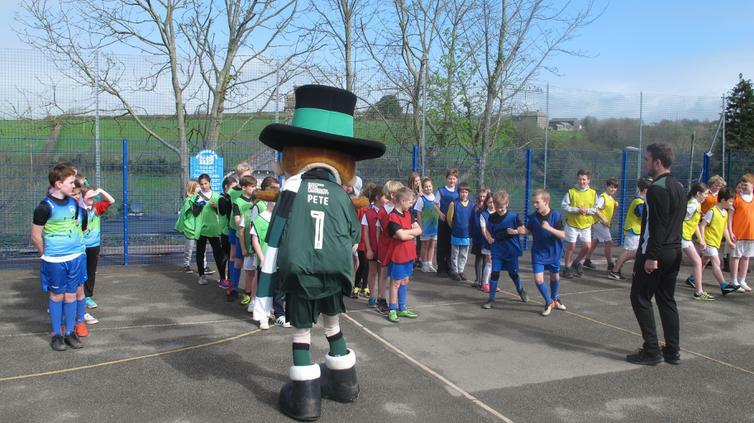 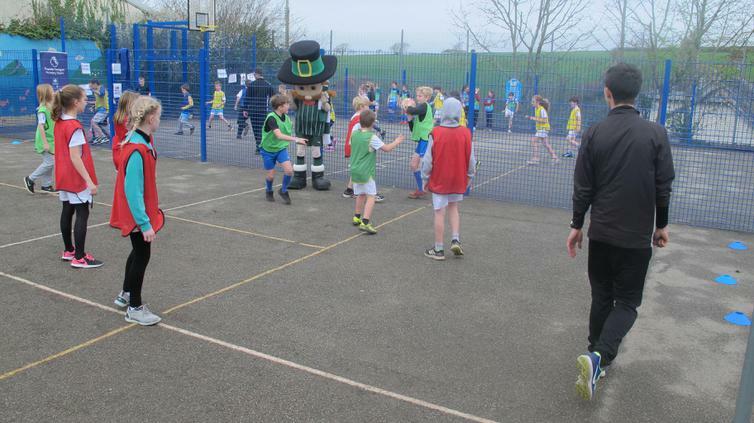 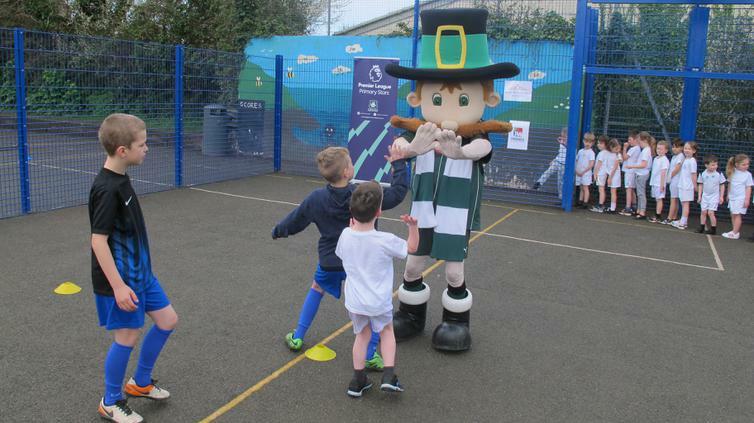 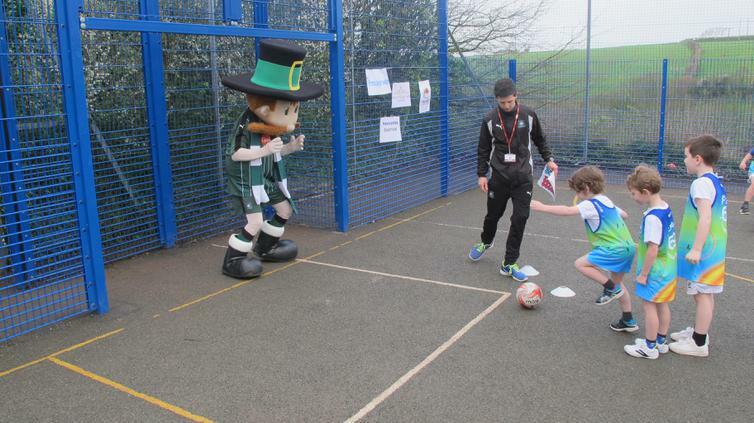 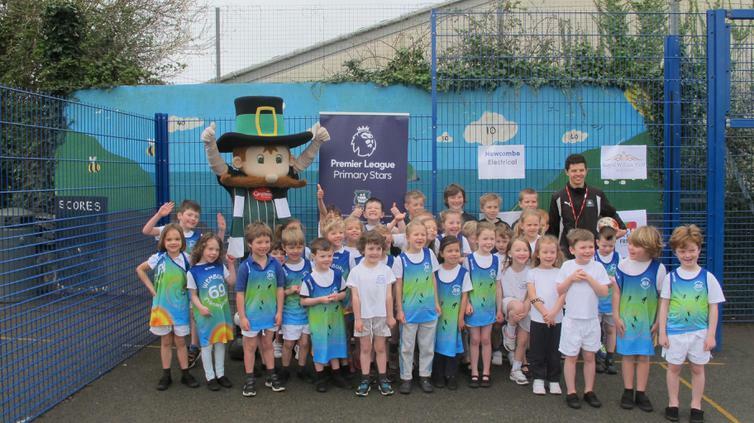 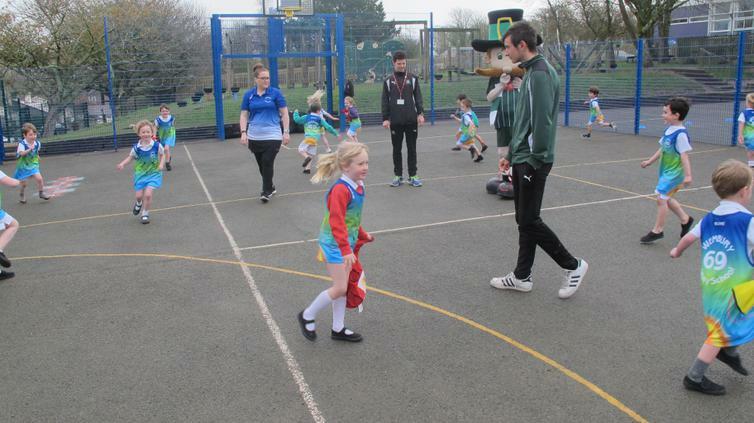 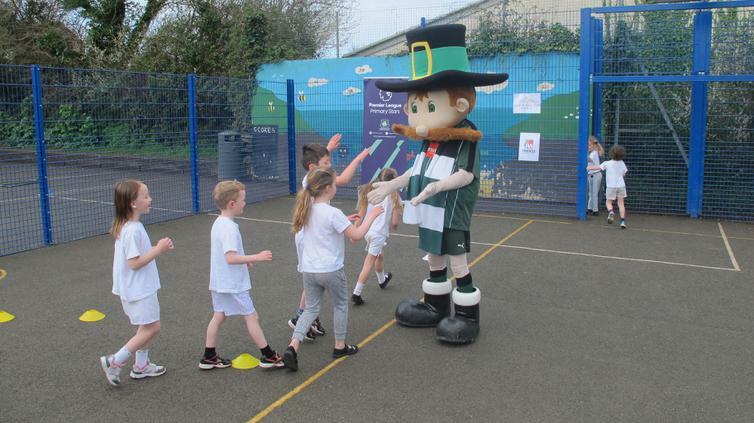 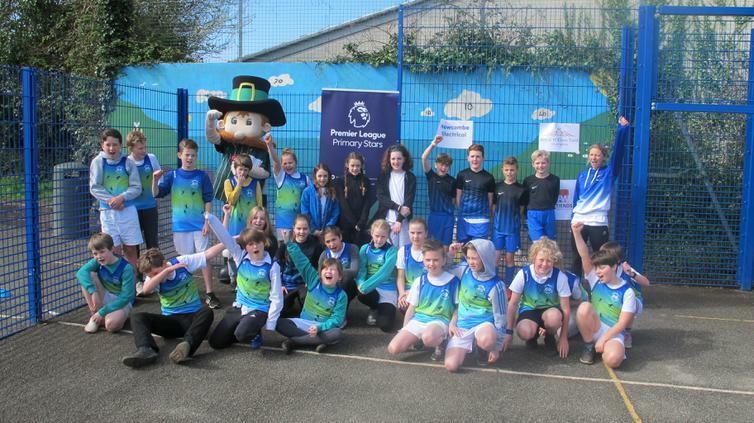 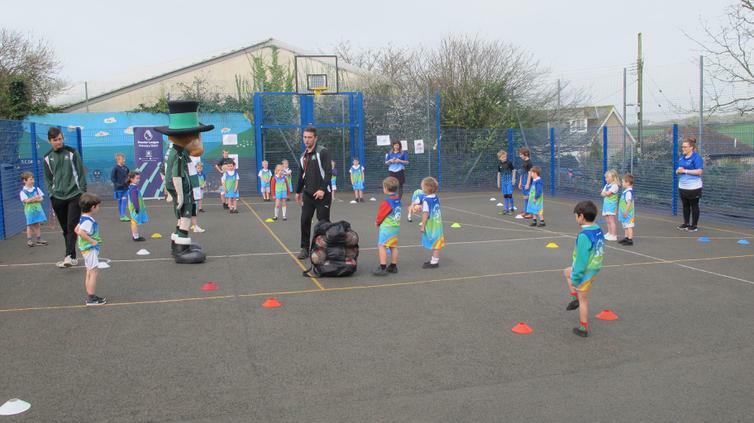 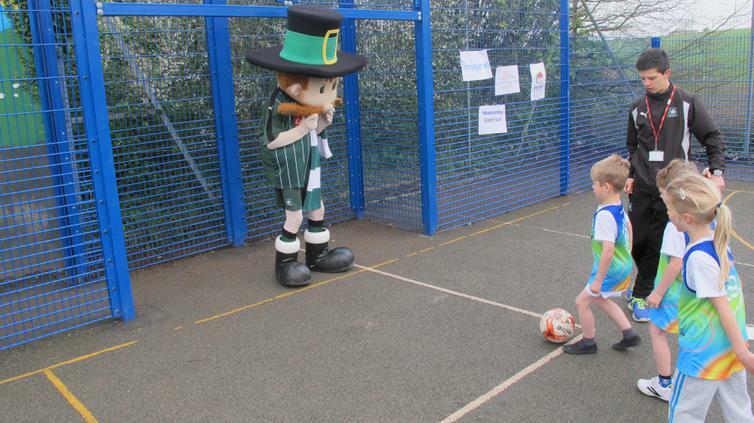 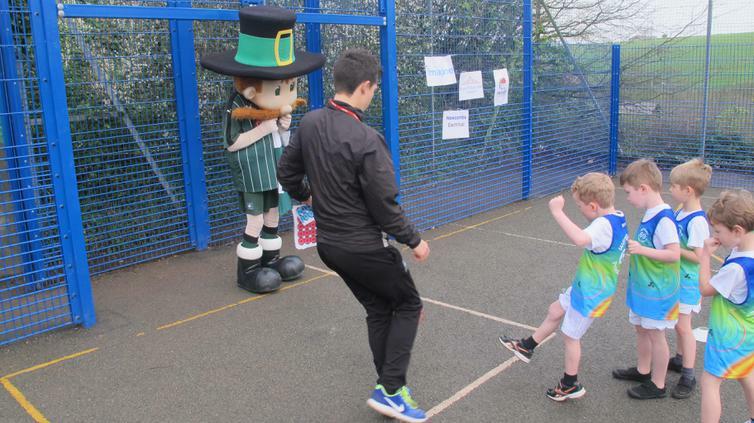 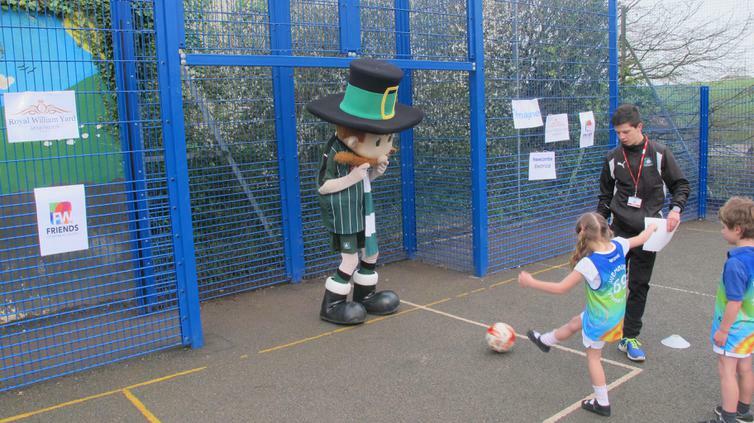 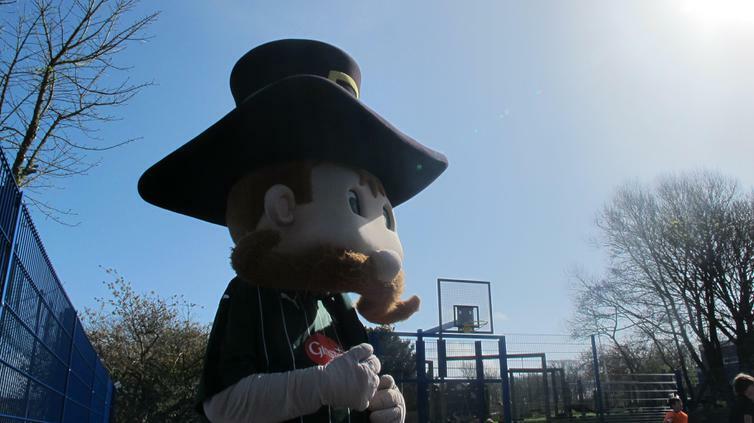 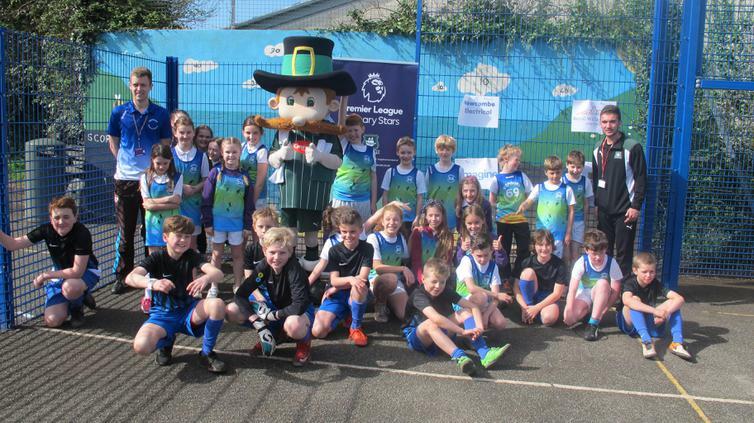 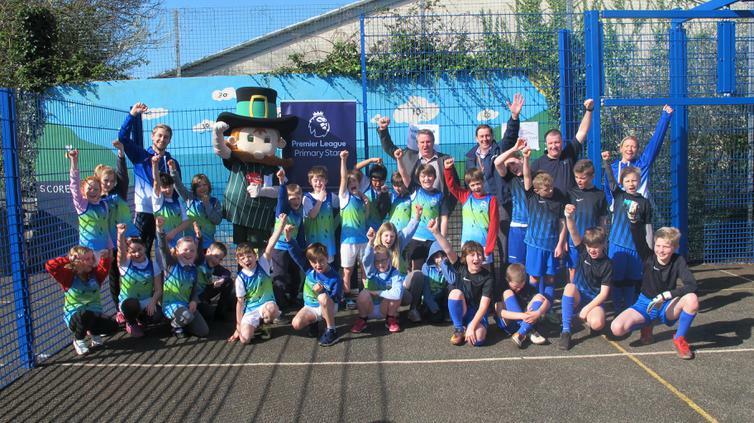 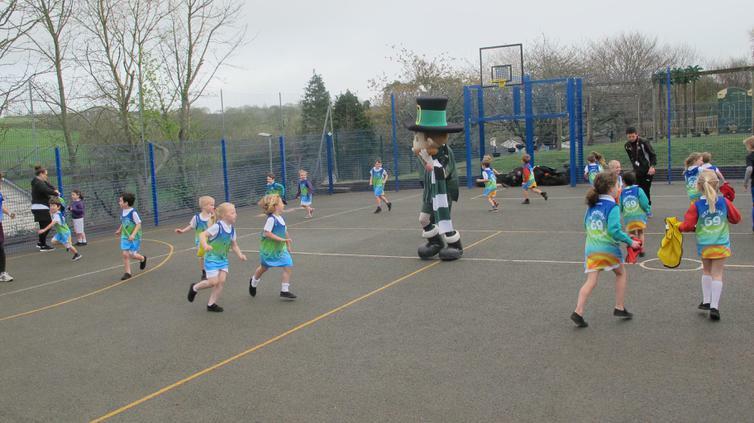 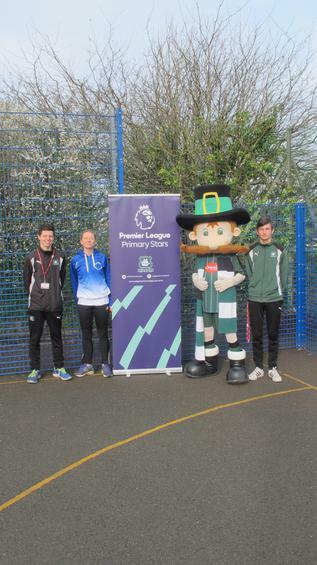 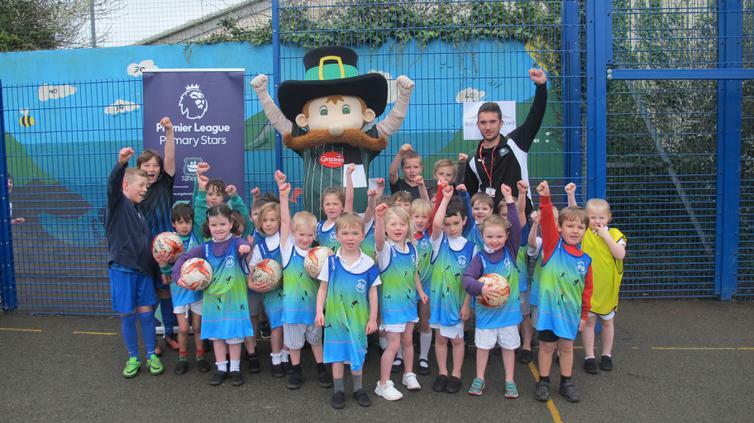 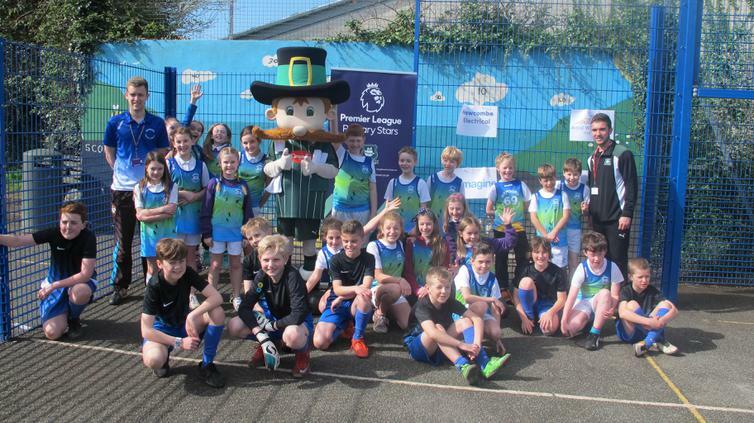 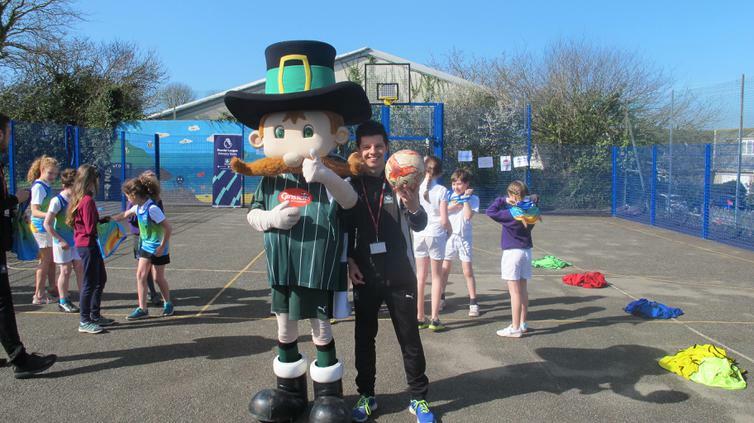 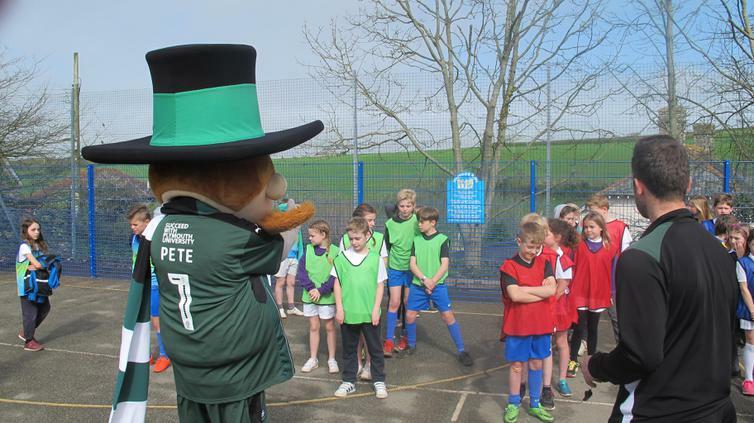 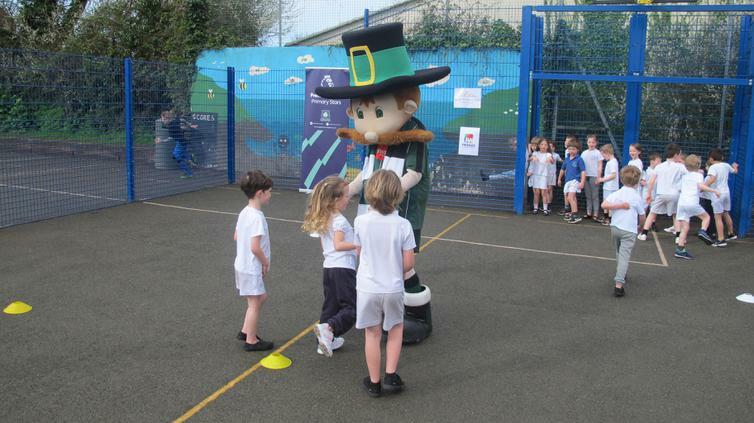 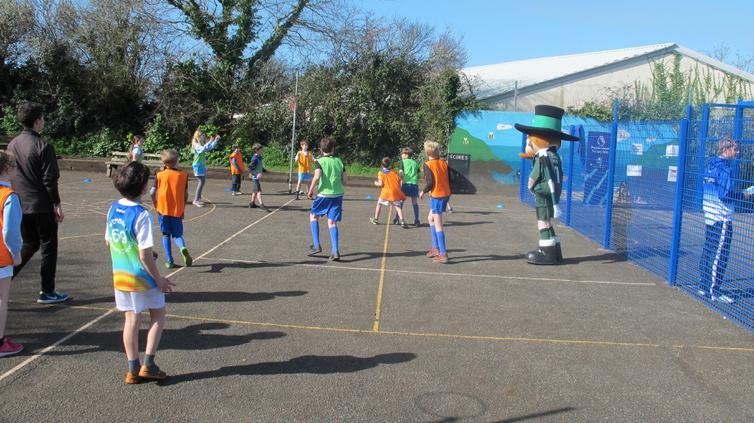 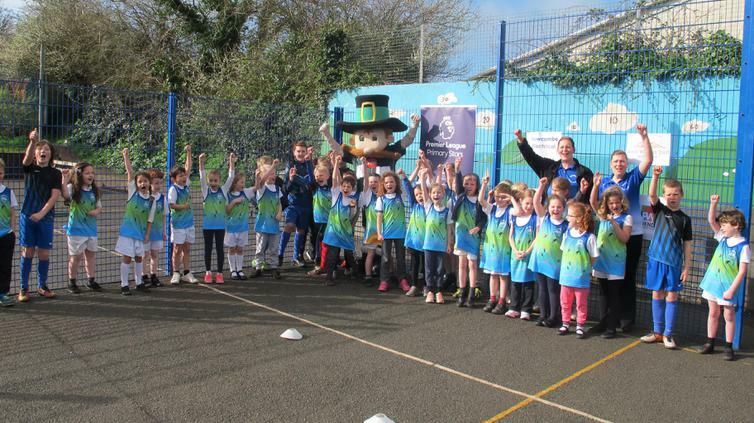 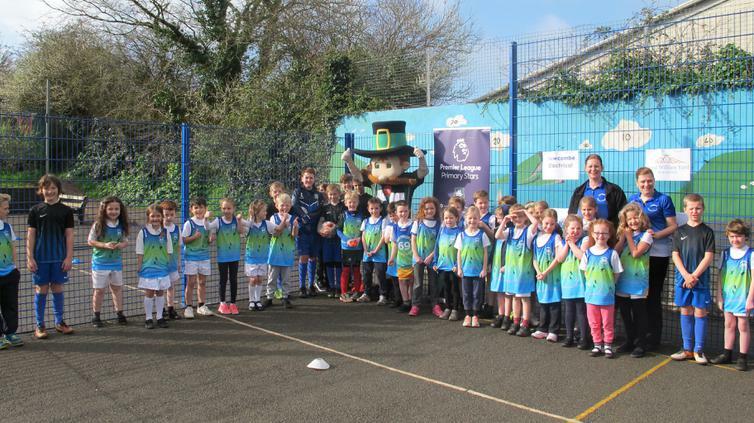 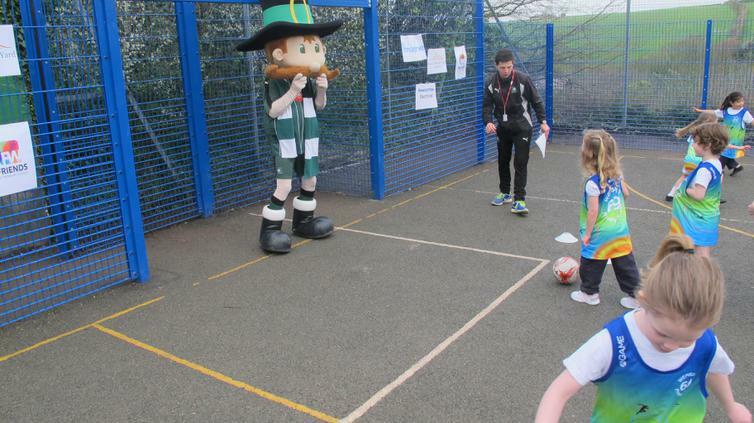 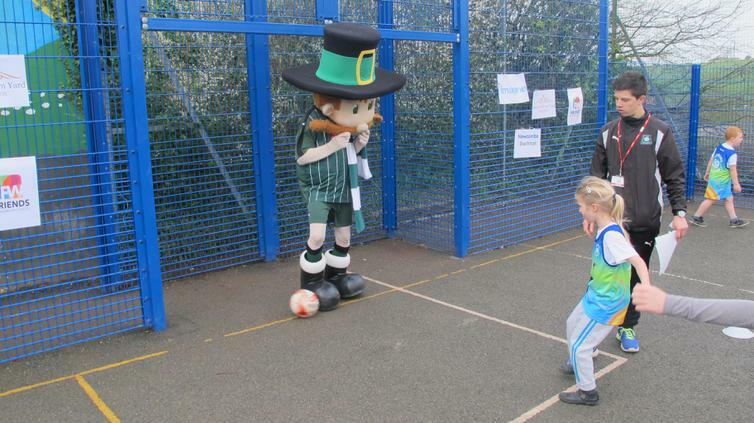 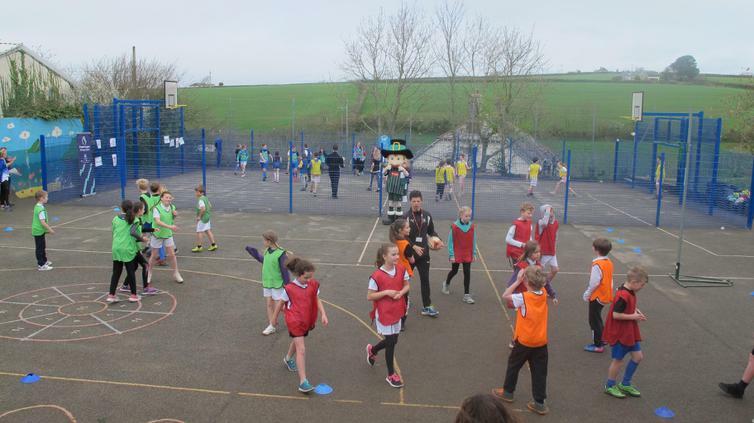 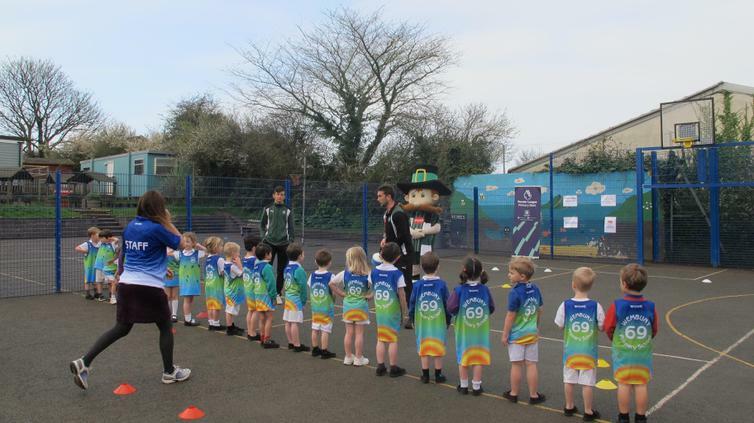 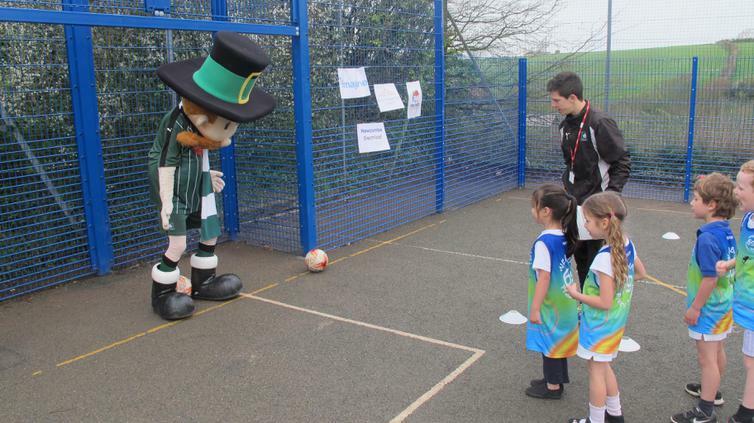 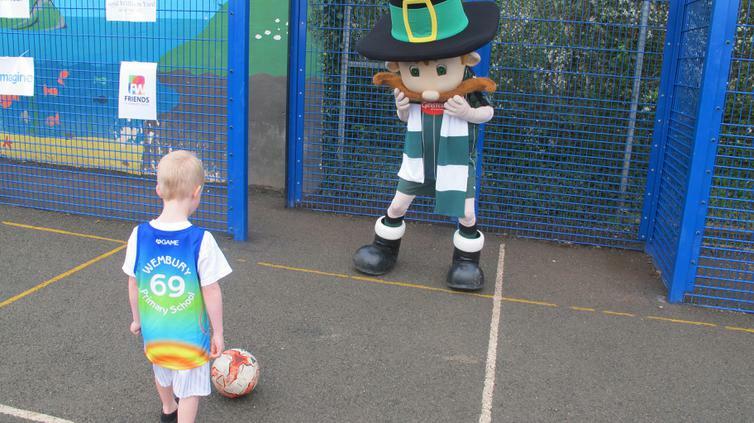 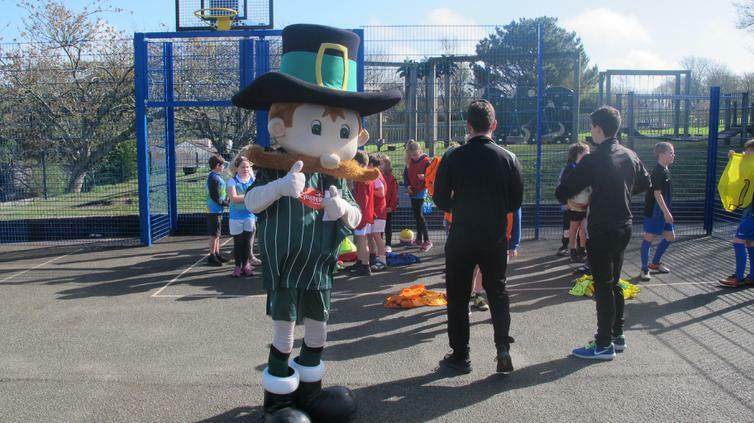 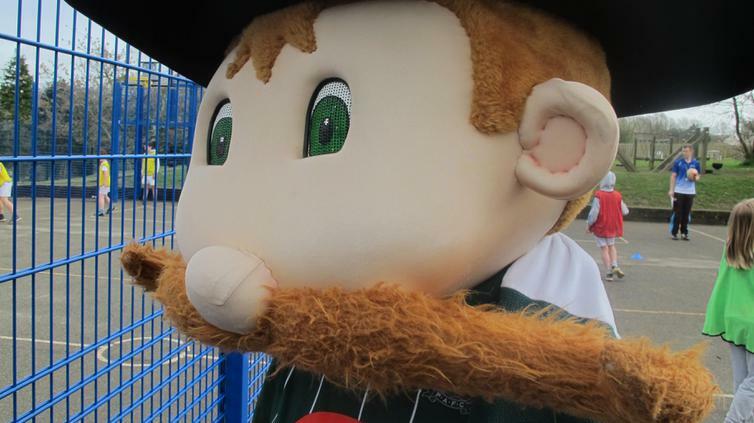 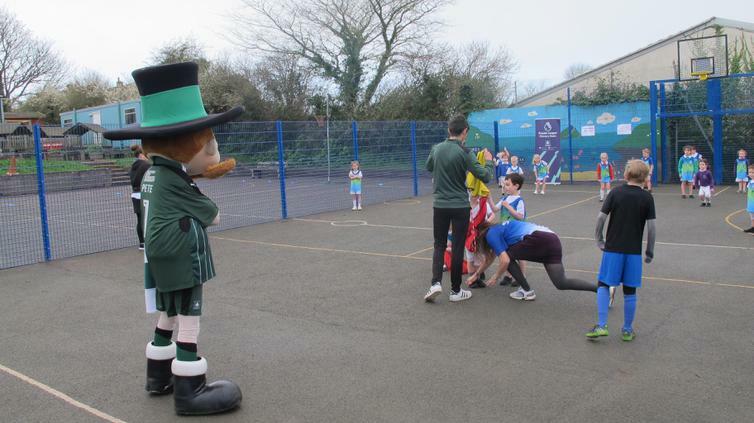 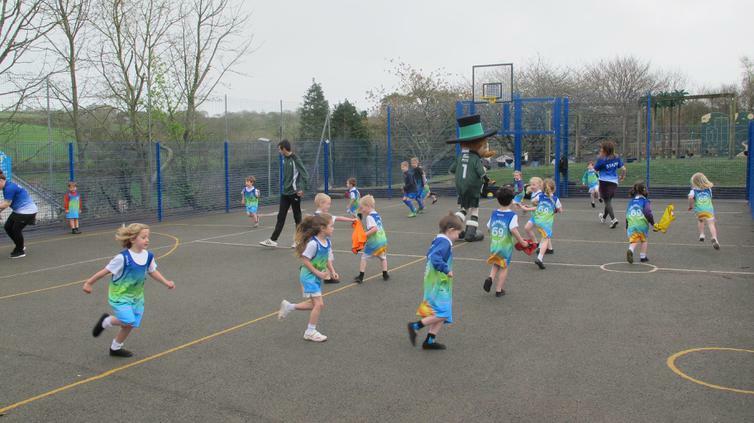 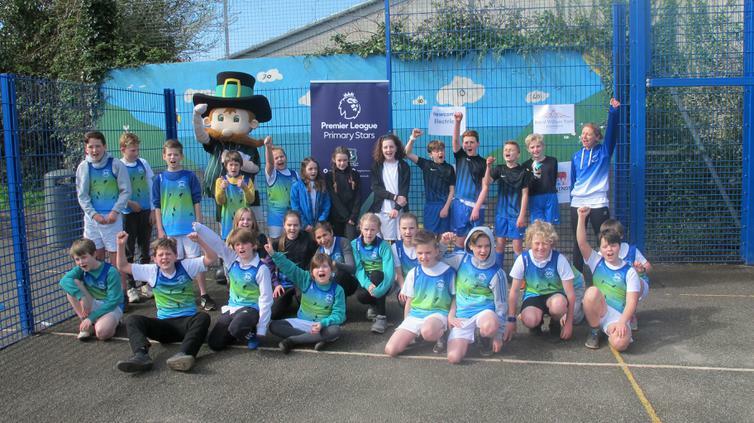 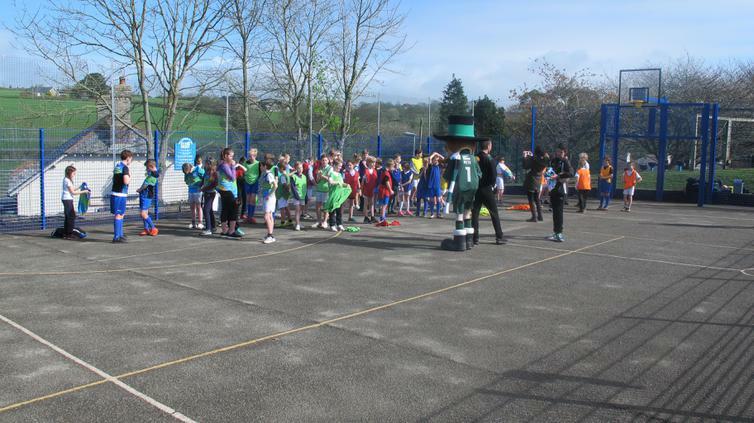 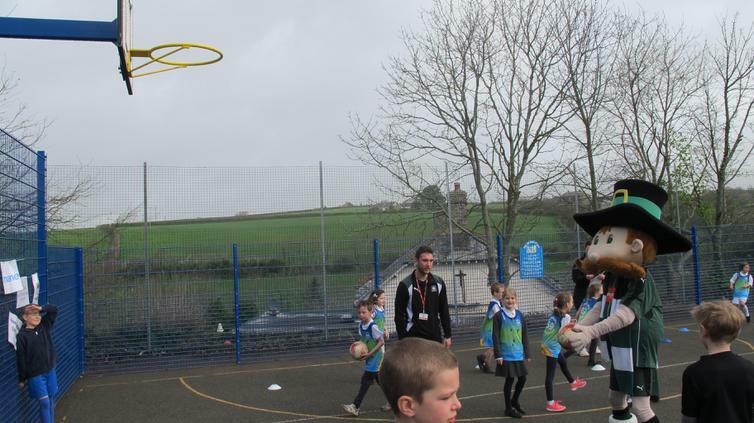 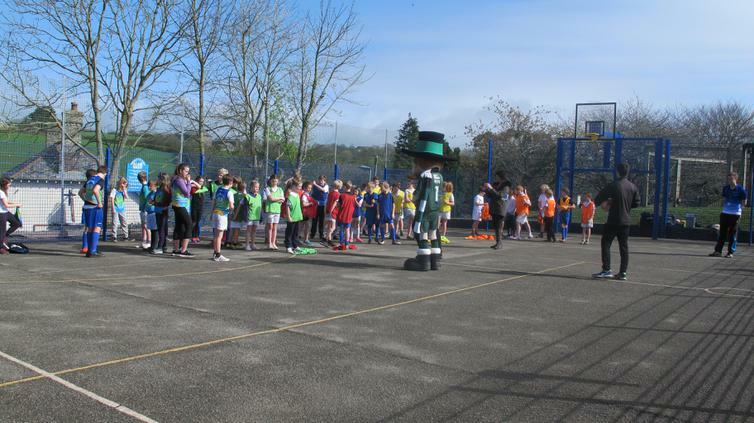 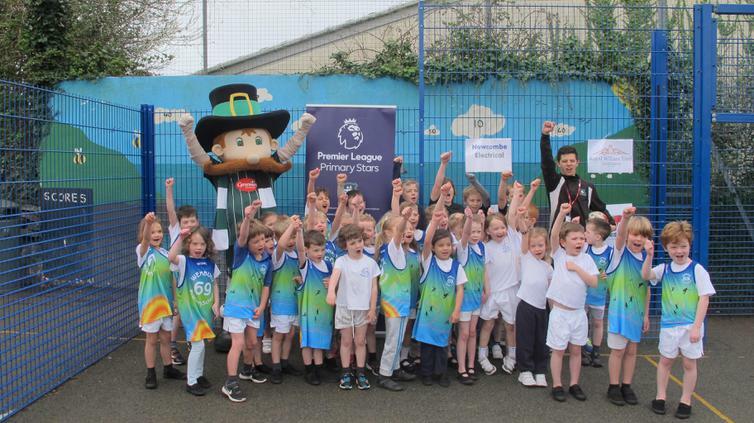 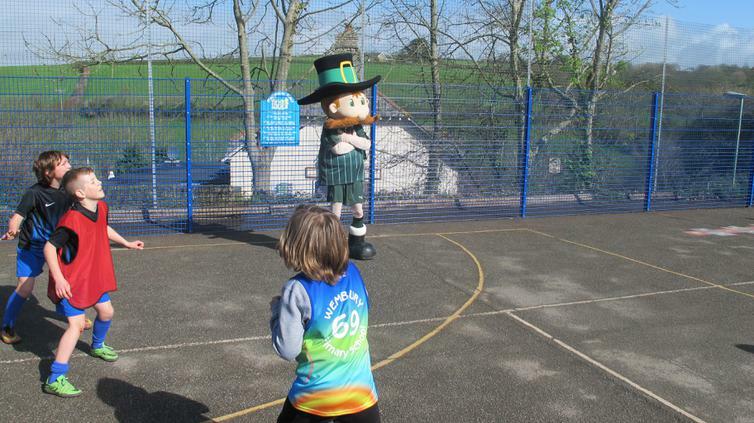 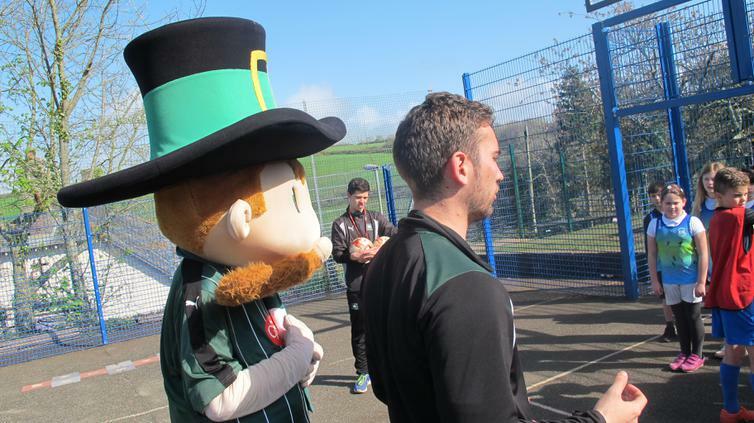 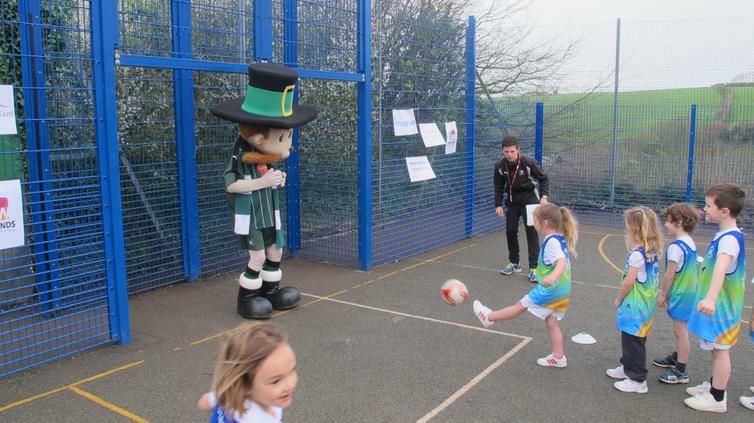 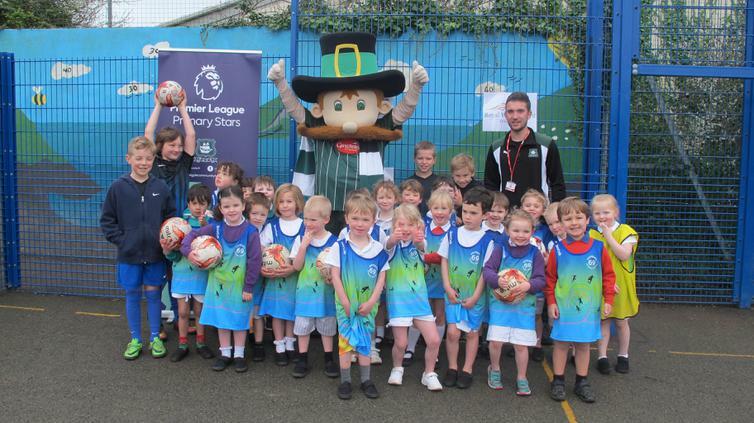 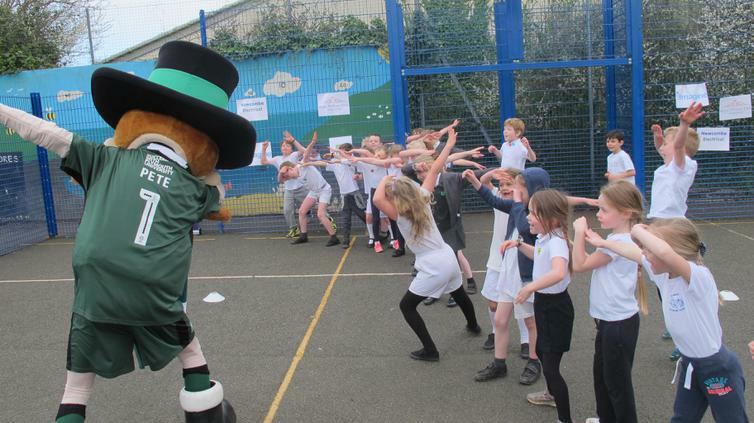 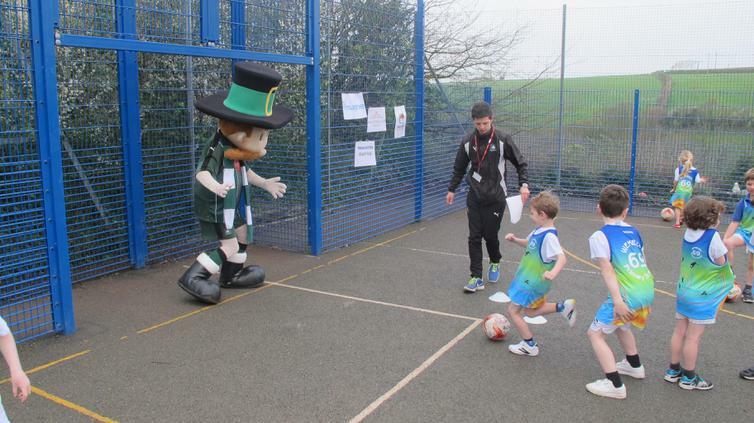 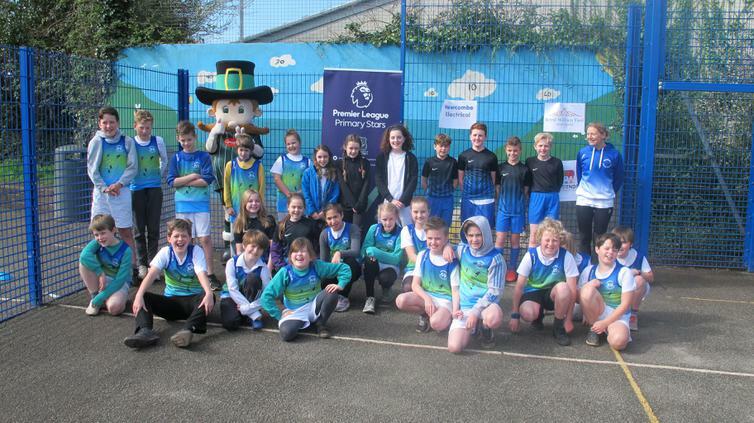 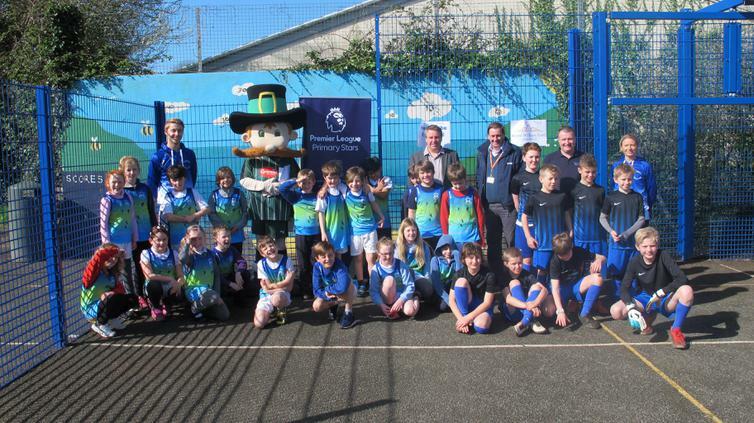 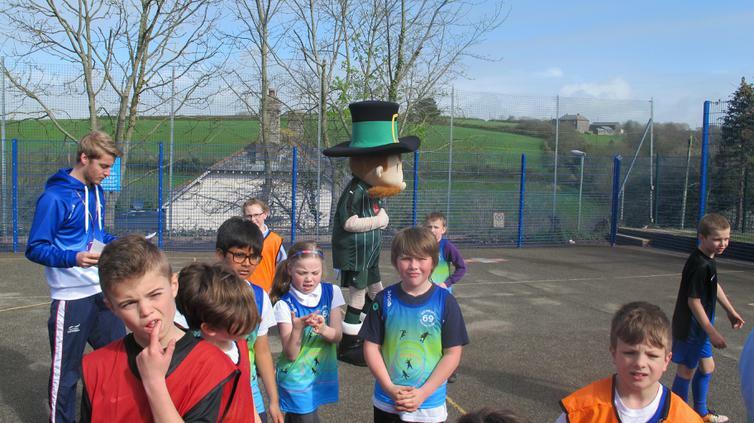 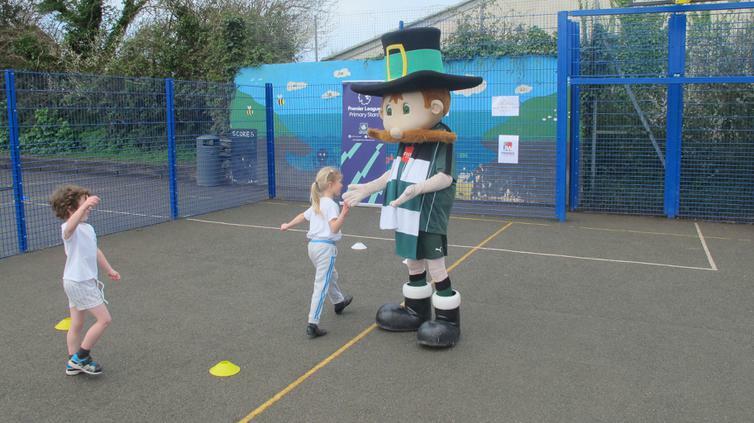 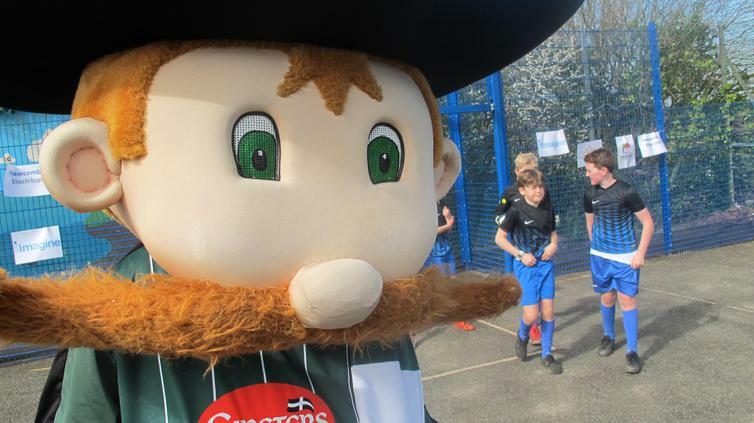 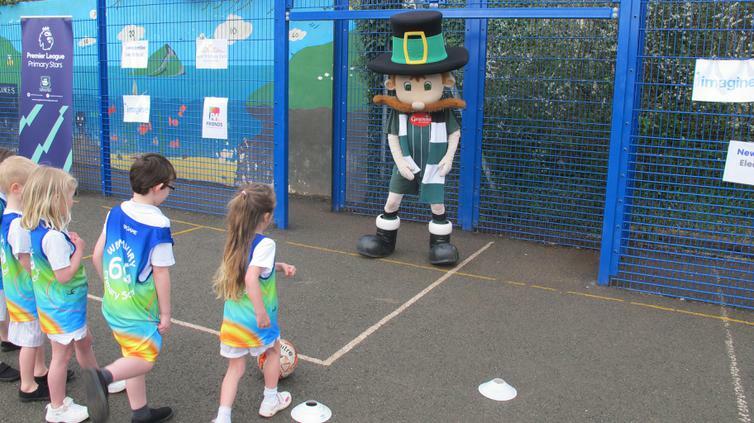 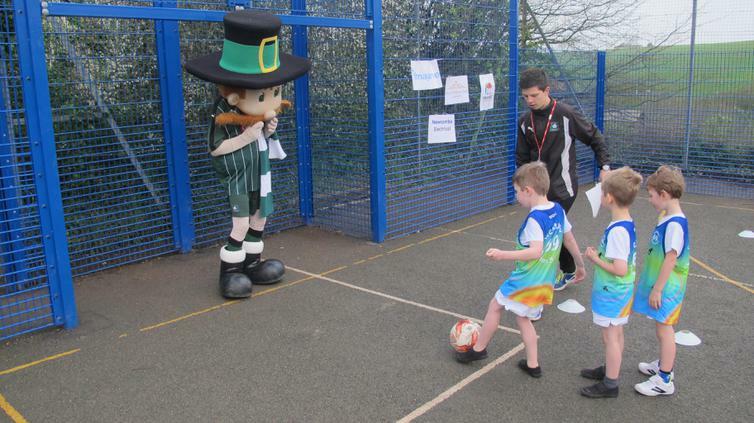 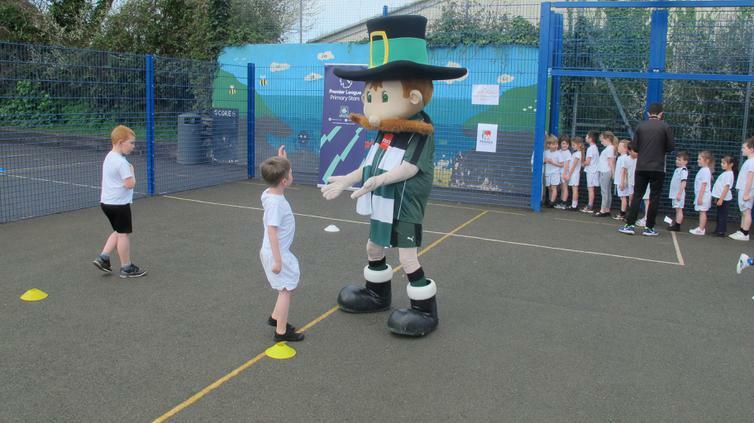 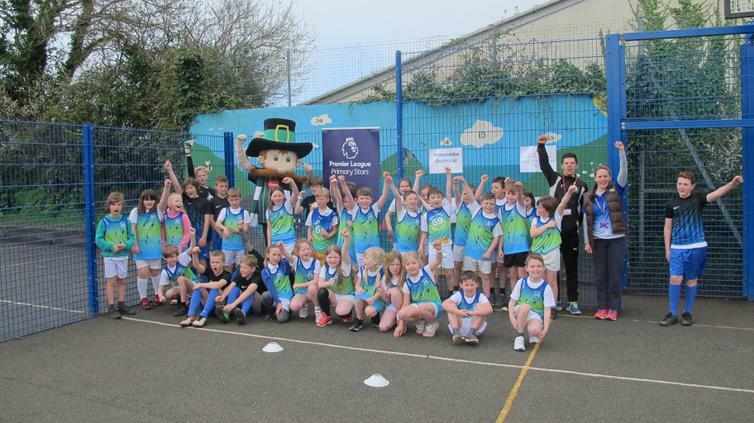 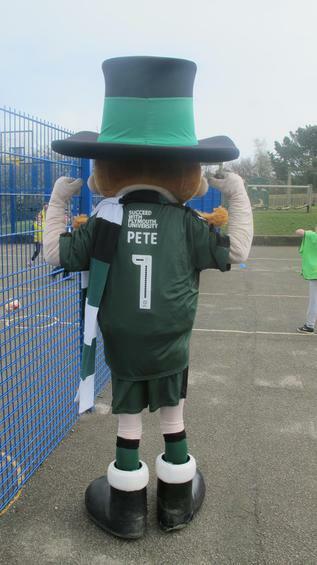 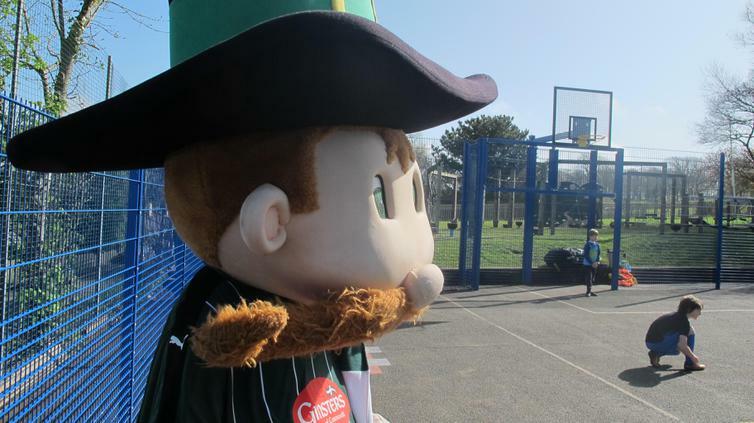 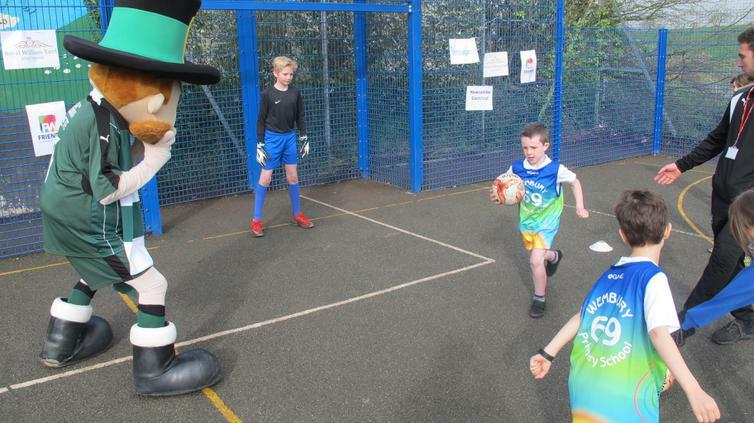 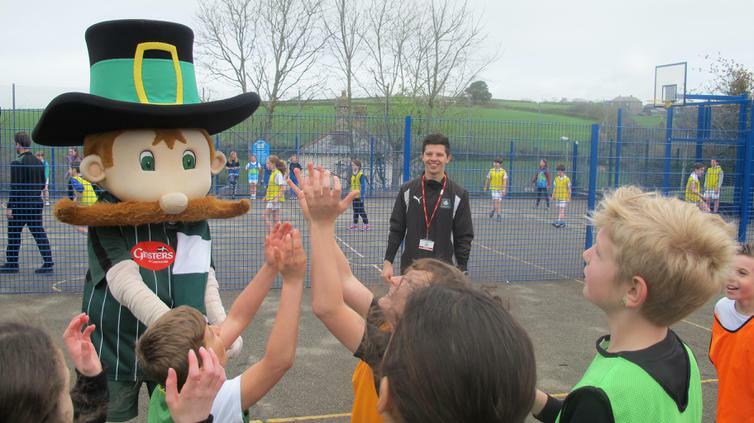 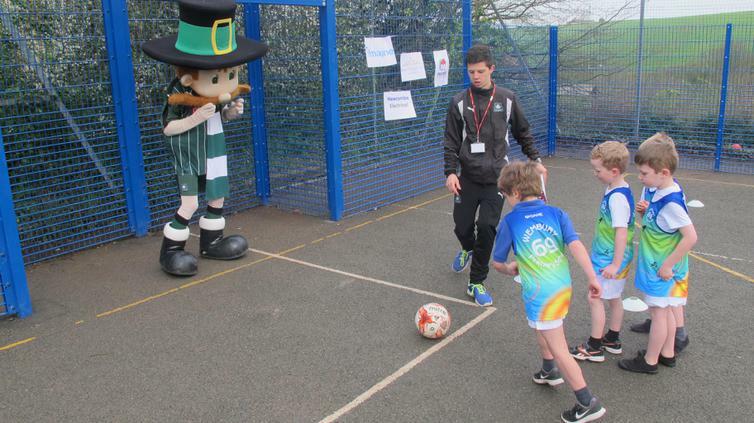 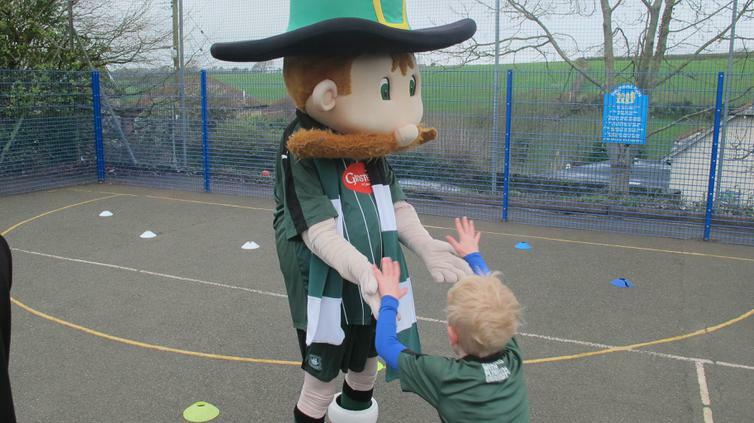 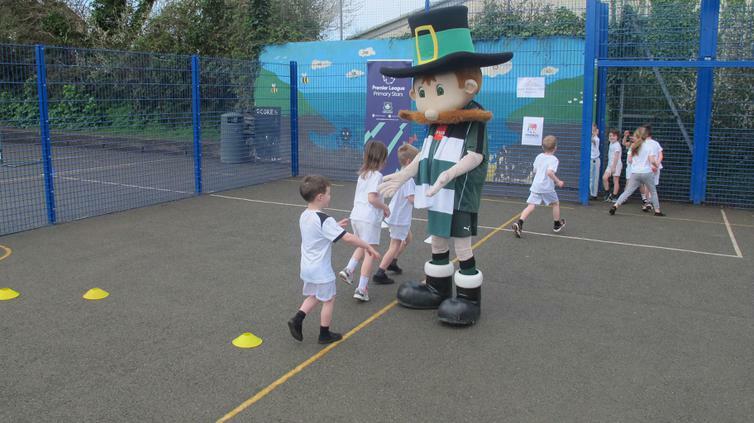 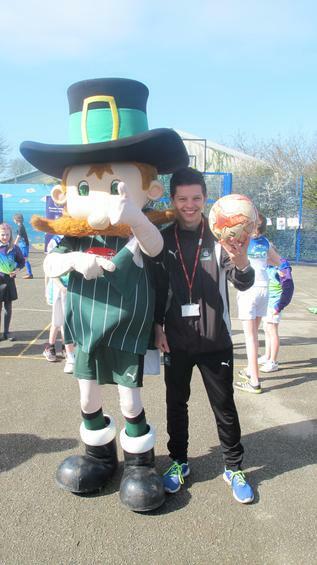 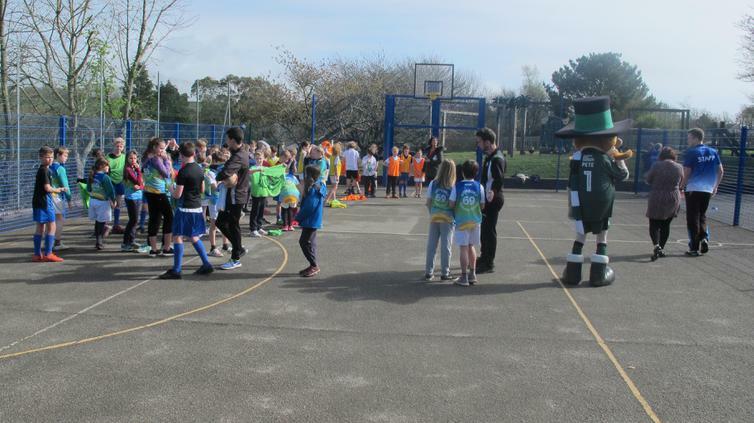 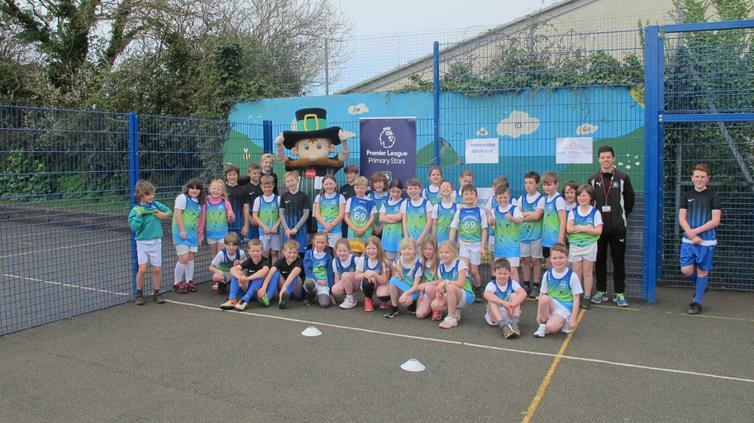 Plymouth Argyle primary stars and community trust coaches came along with a very special guest, their mascot, Pilgrim Pete! 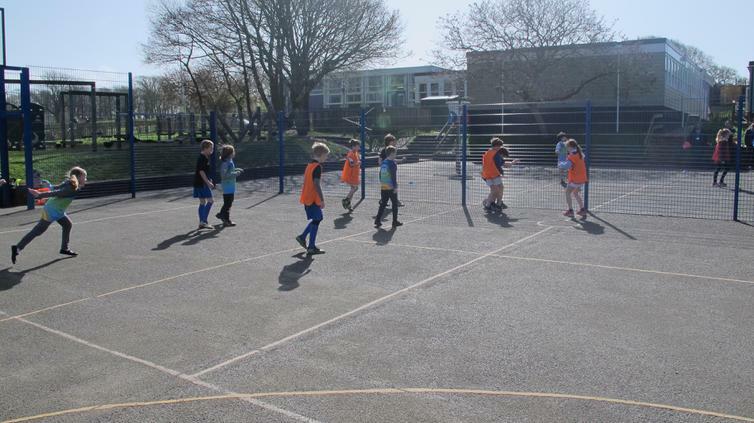 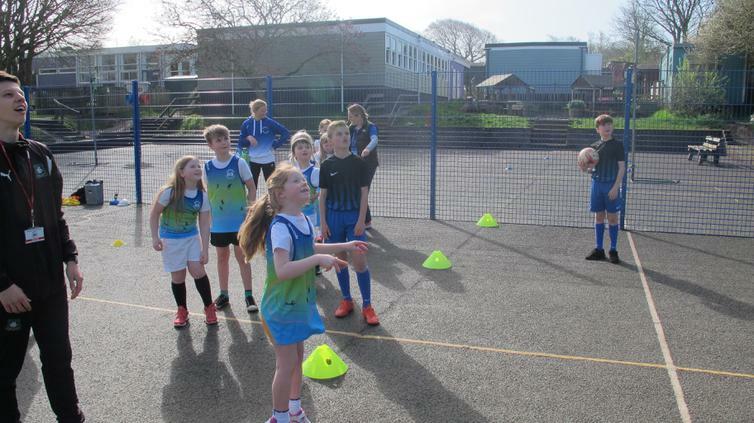 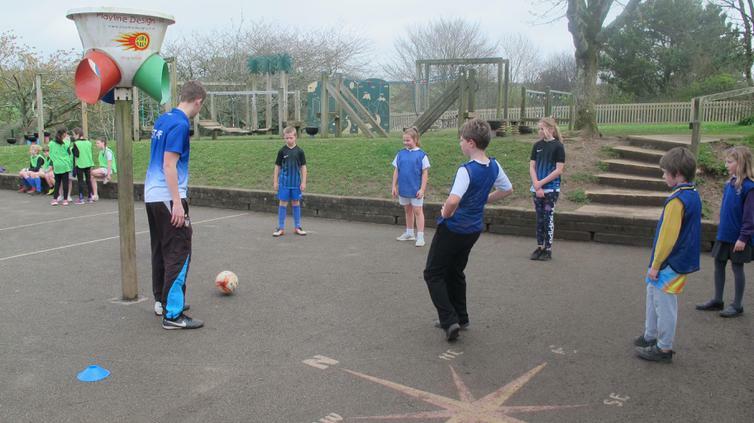 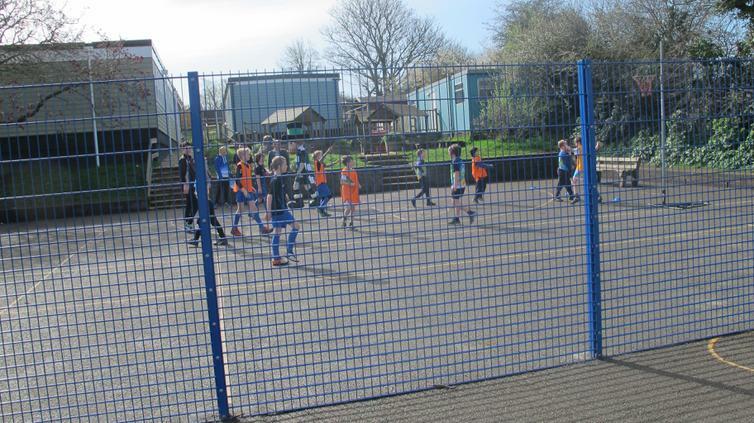 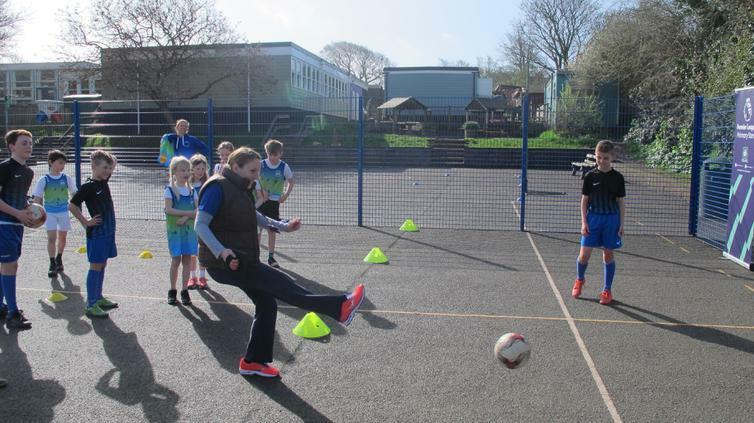 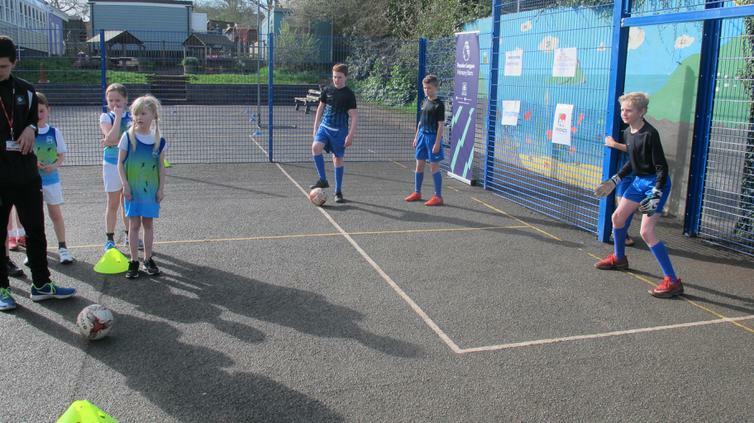 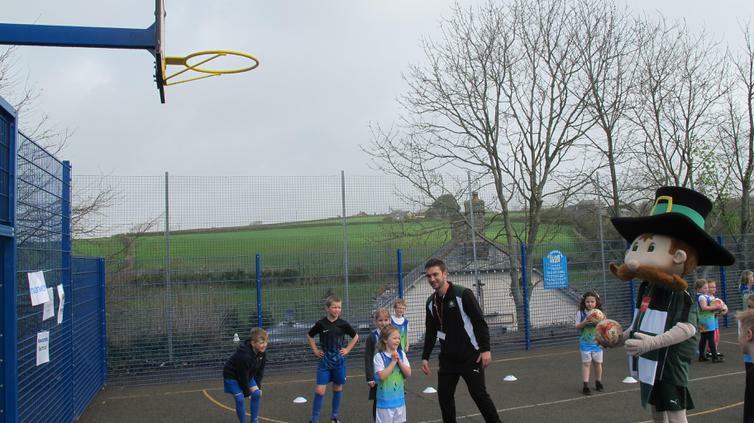 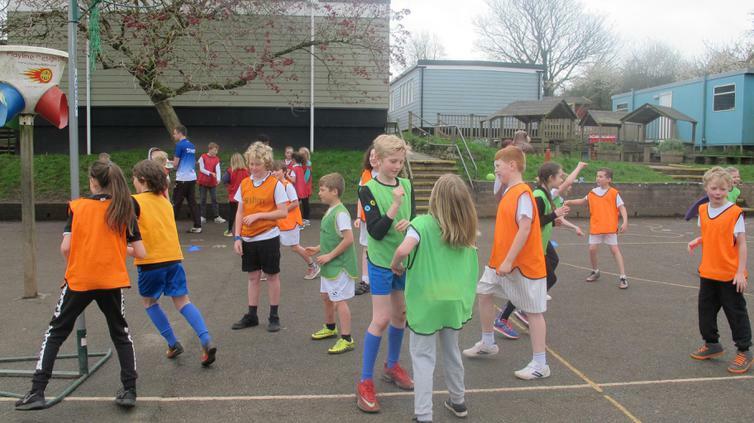 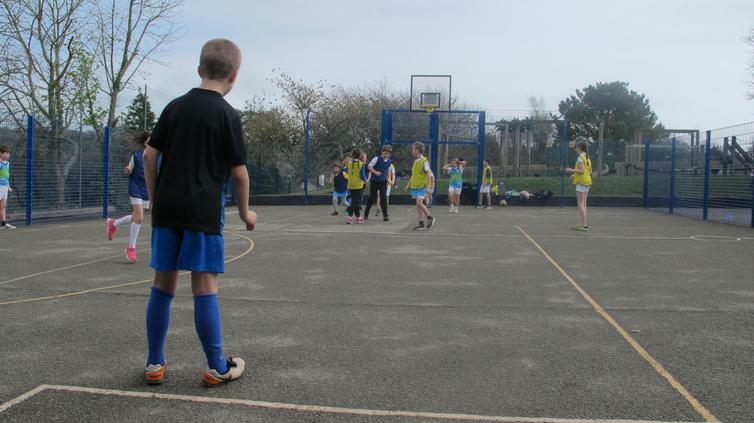 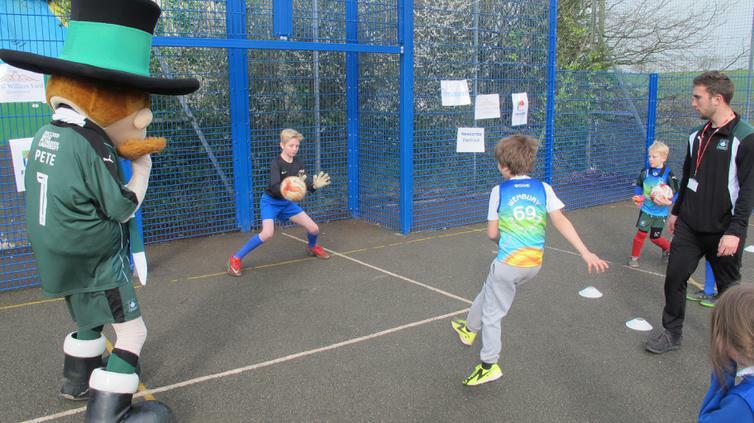 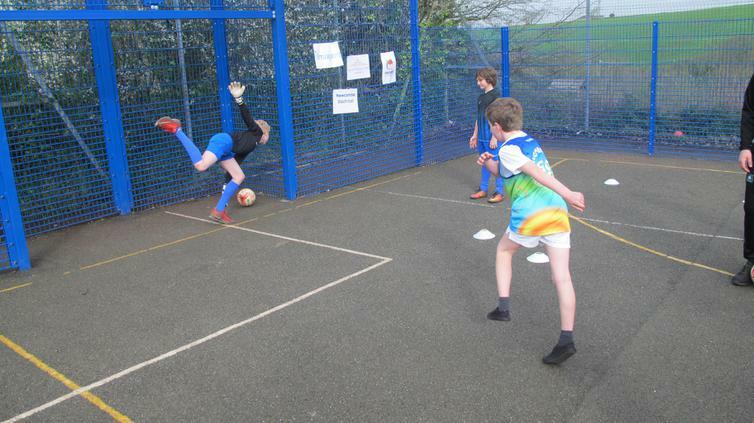 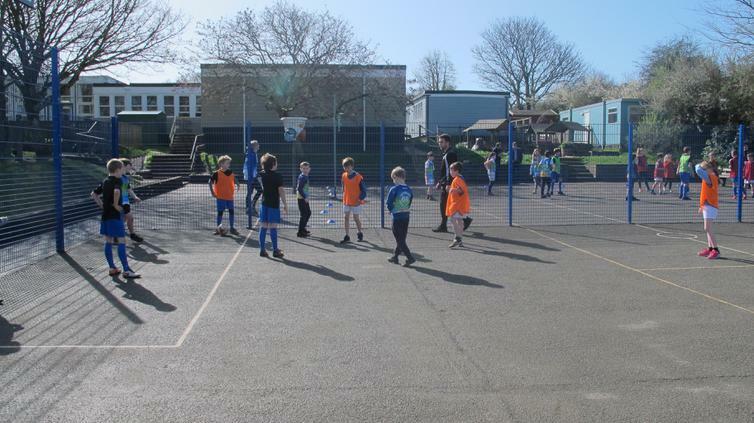 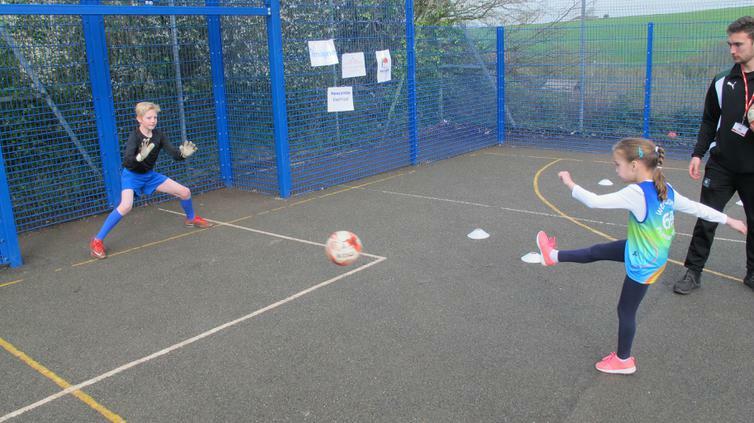 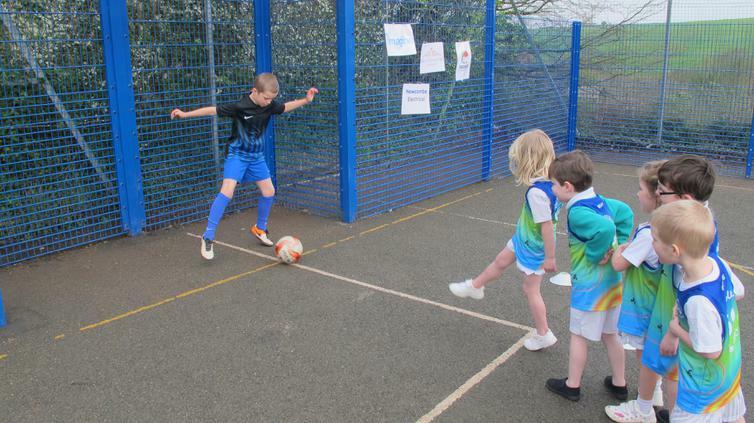 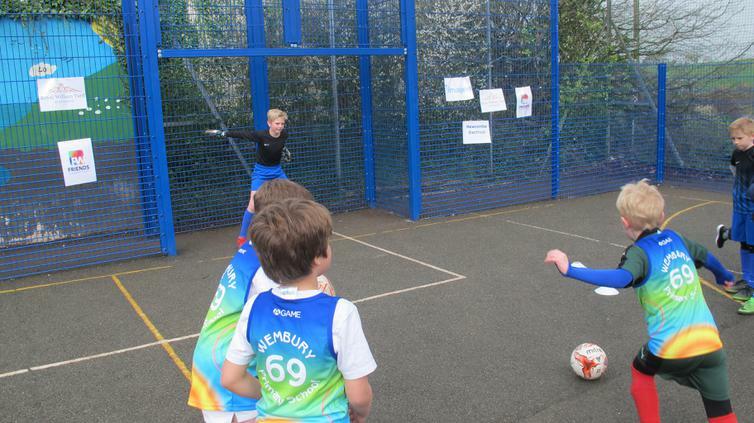 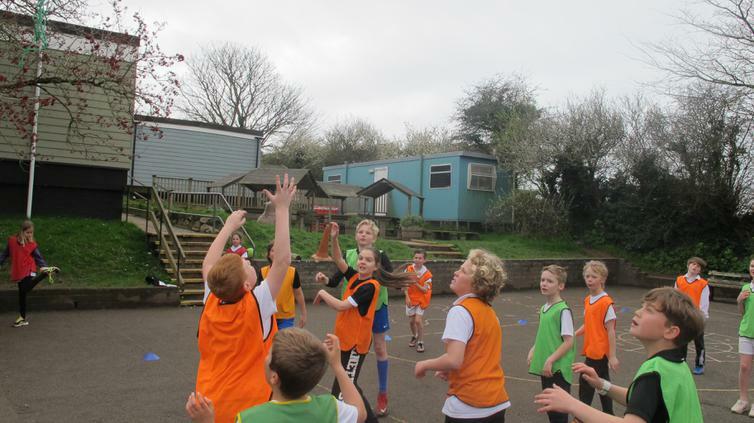 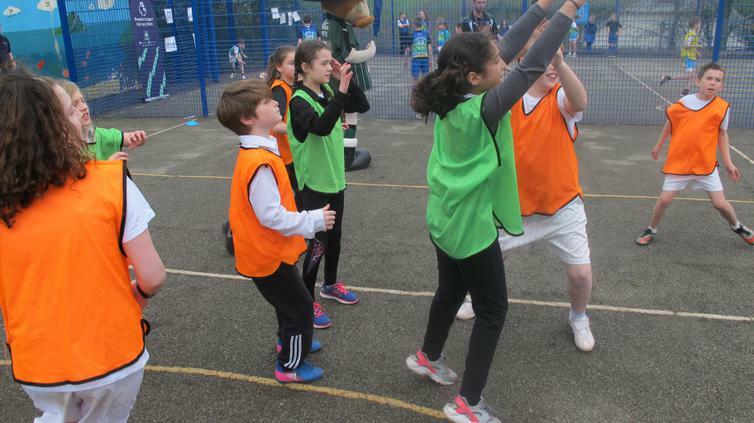 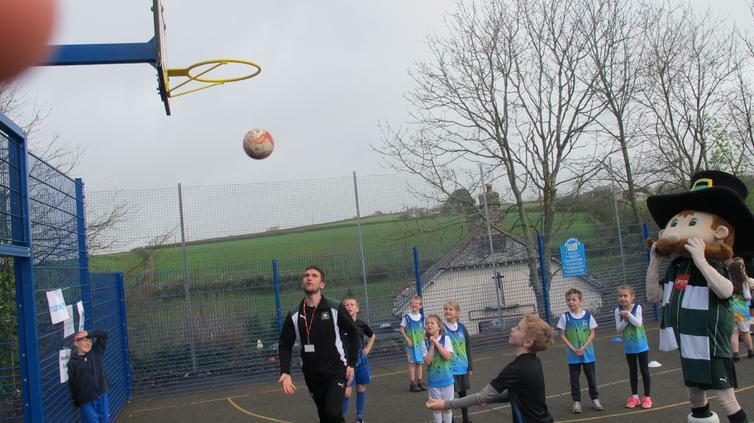 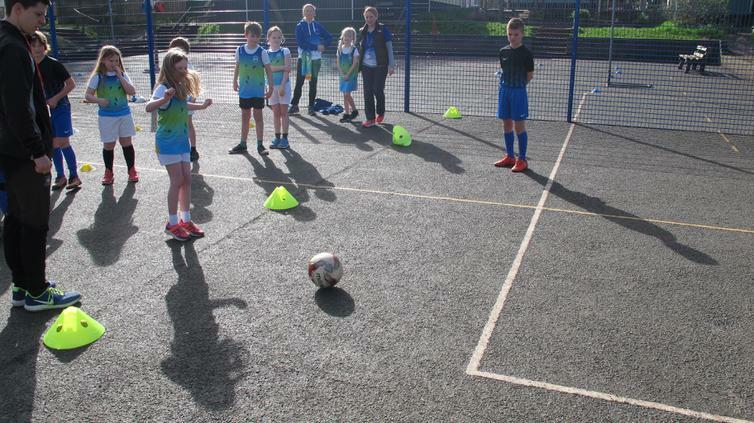 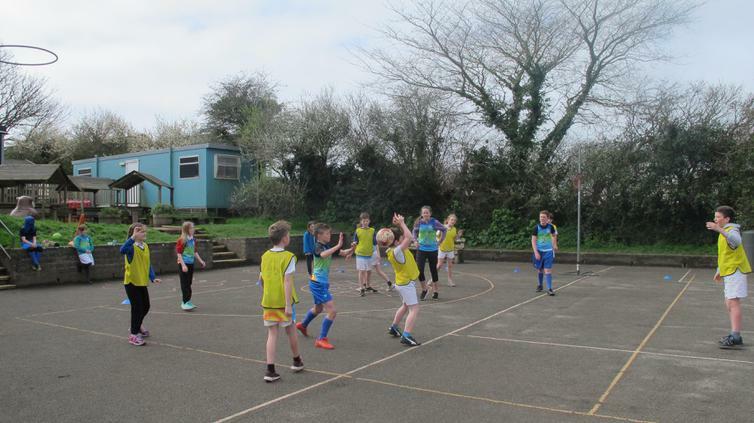 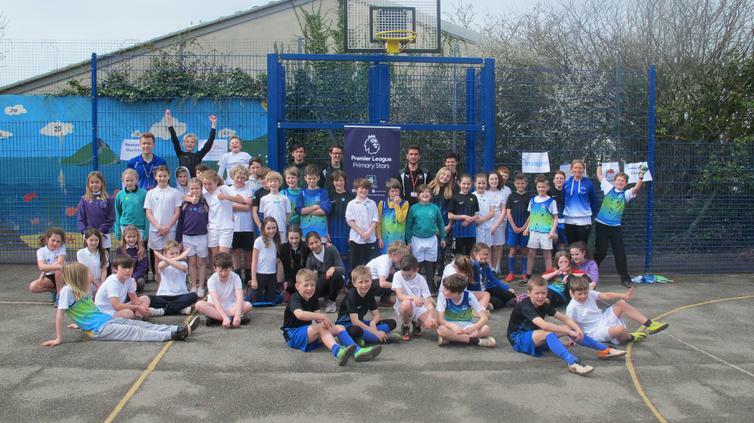 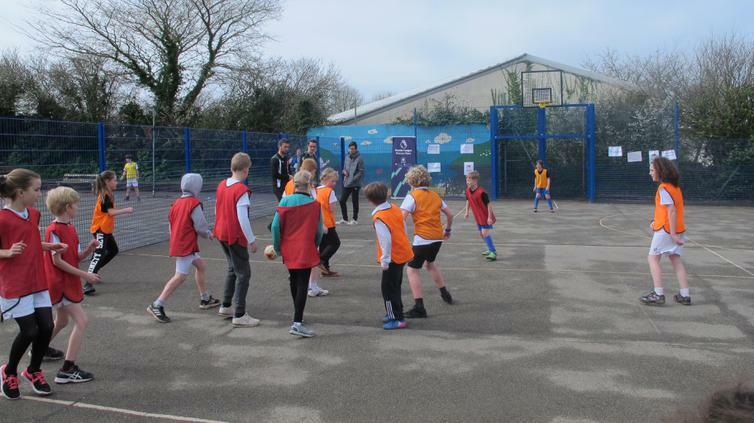 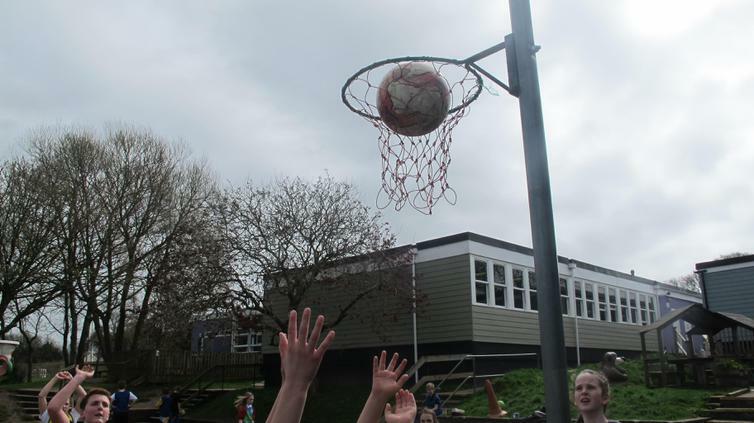 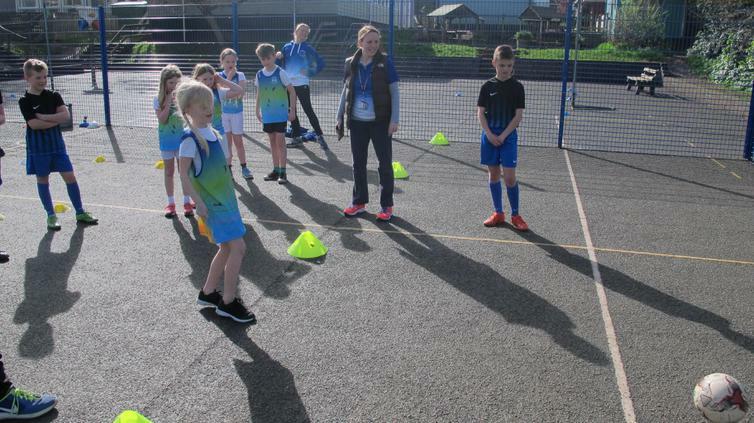 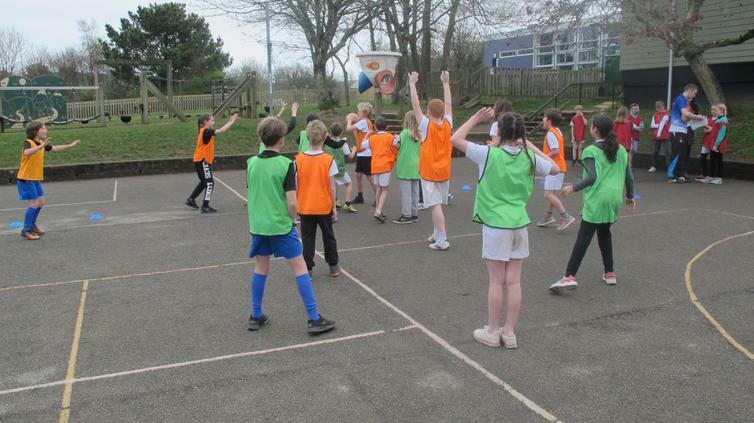 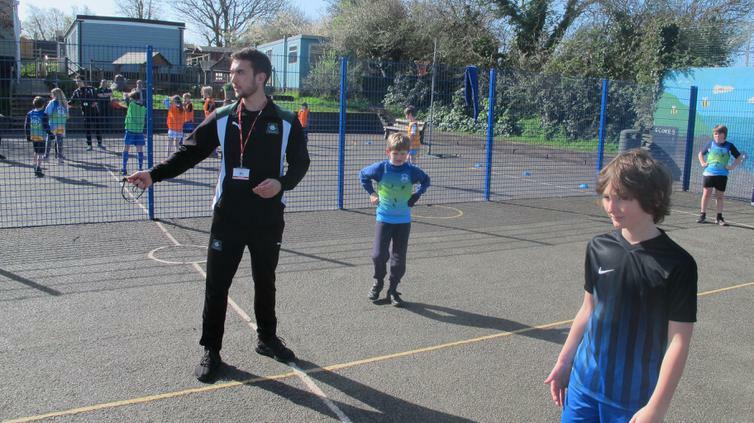 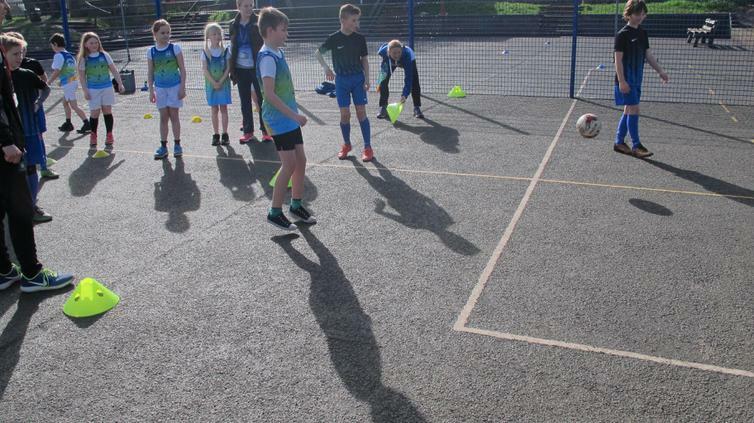 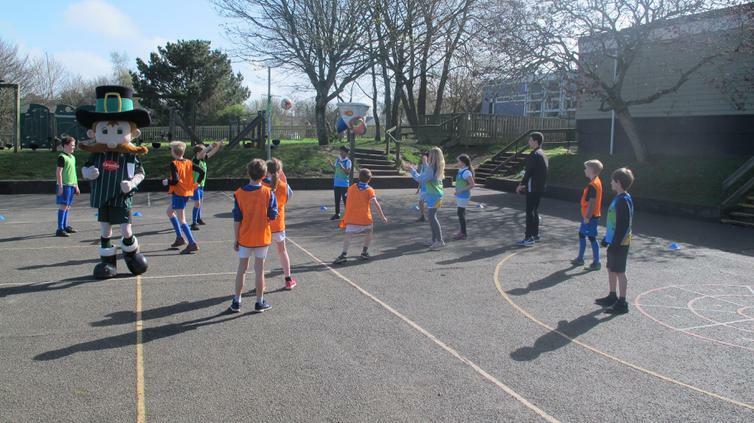 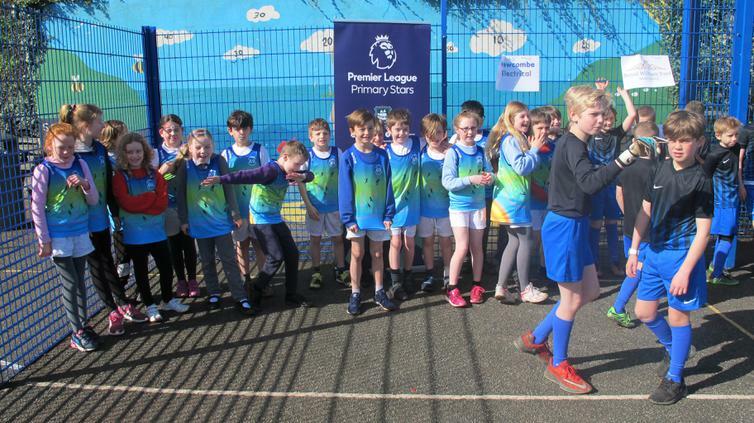 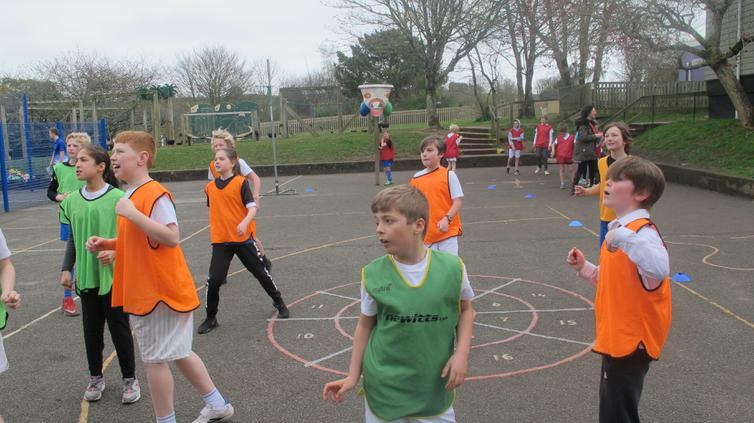 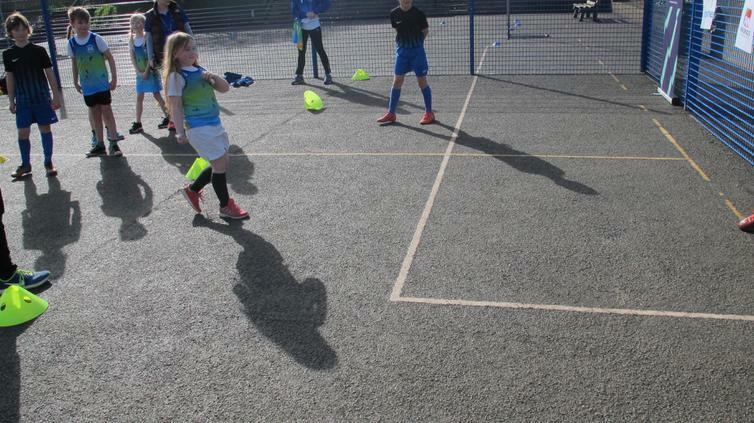 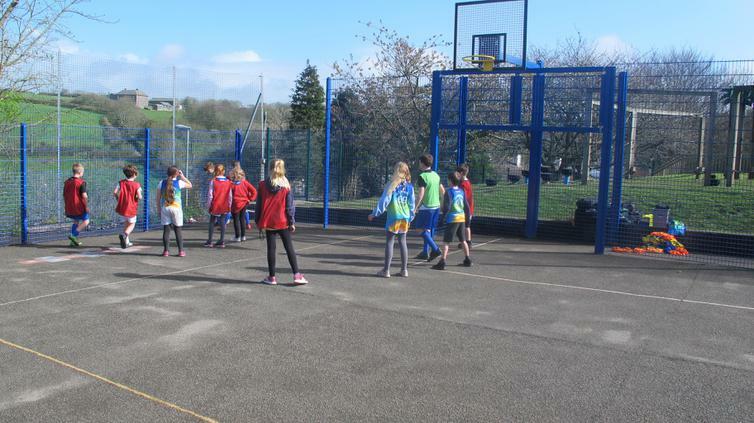 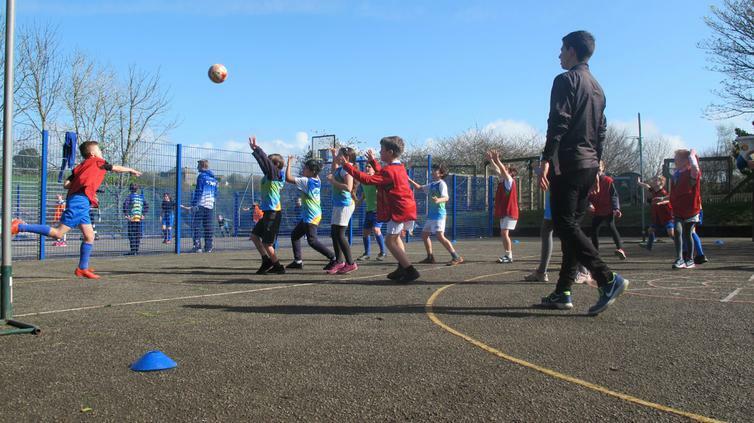 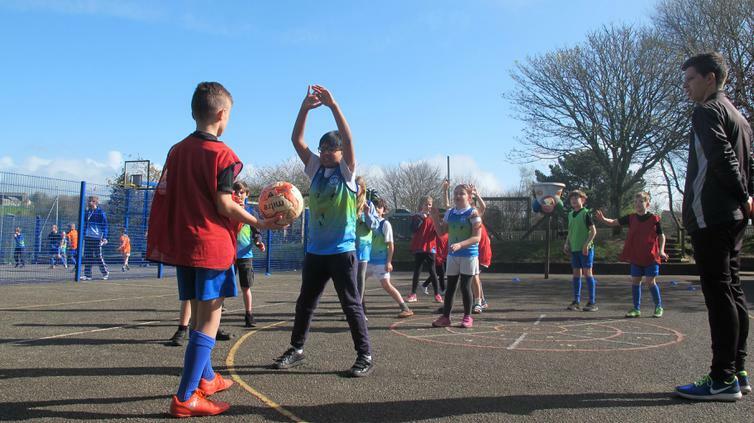 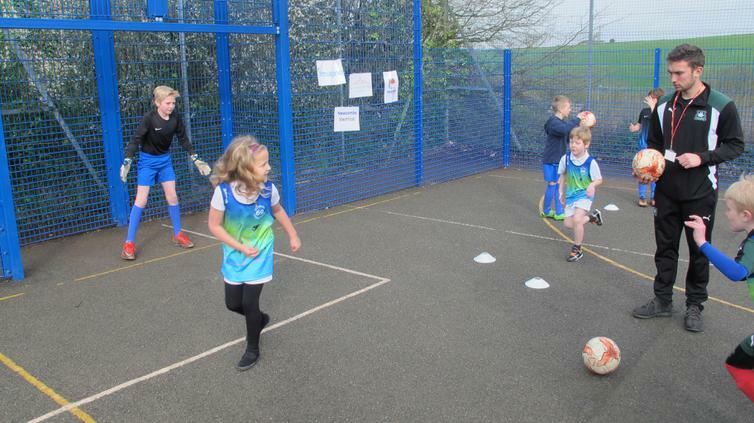 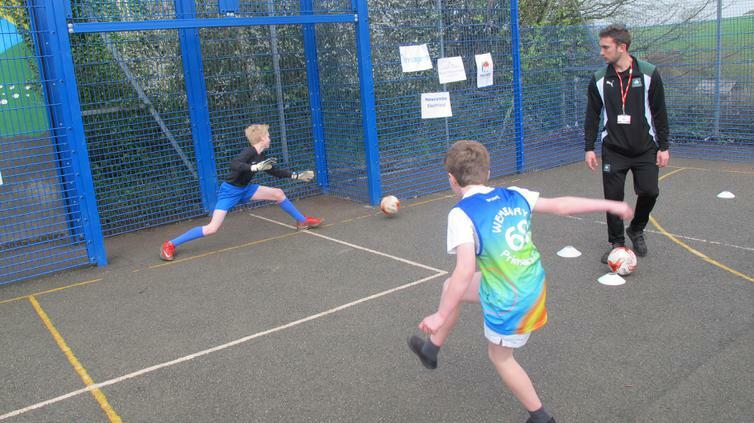 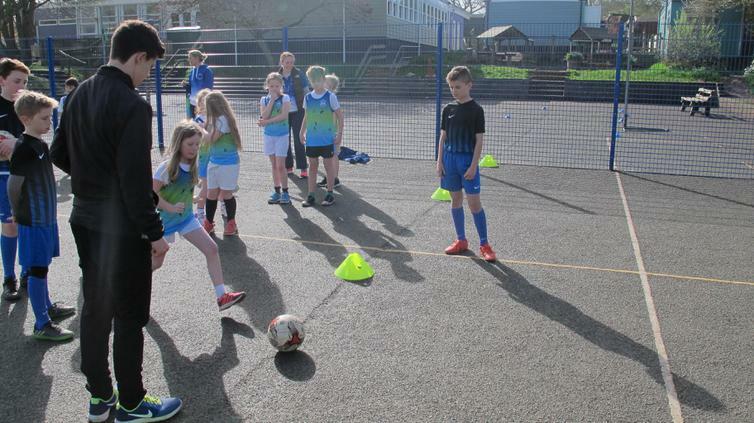 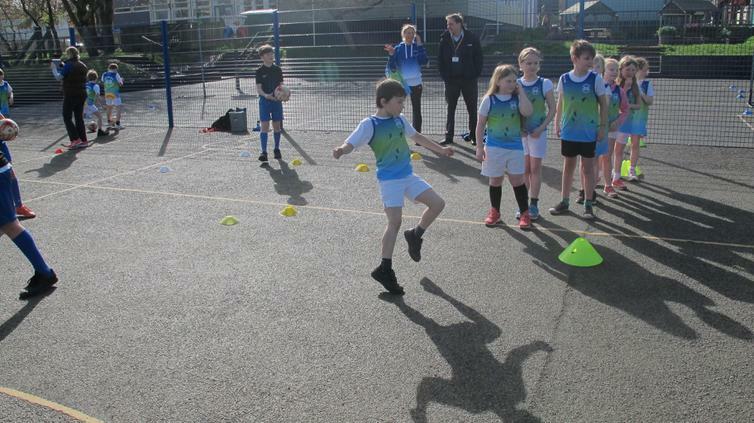 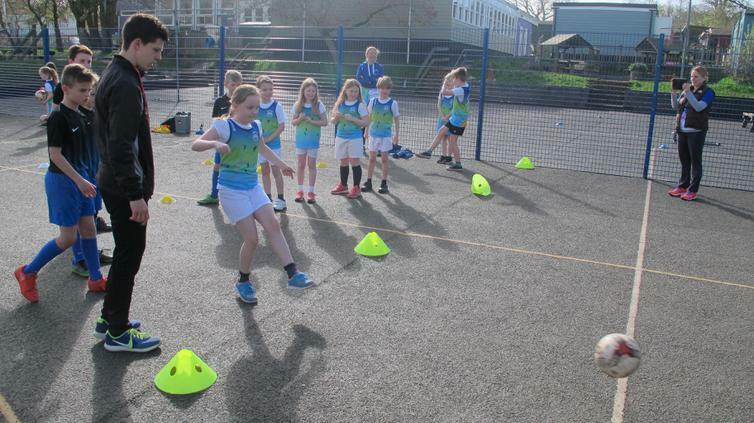 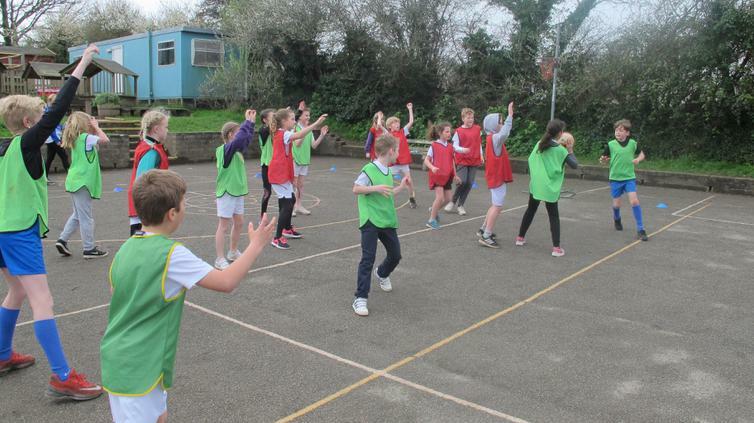 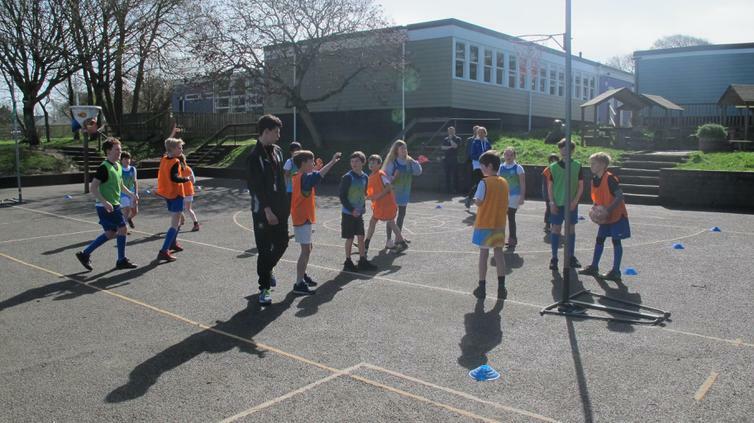 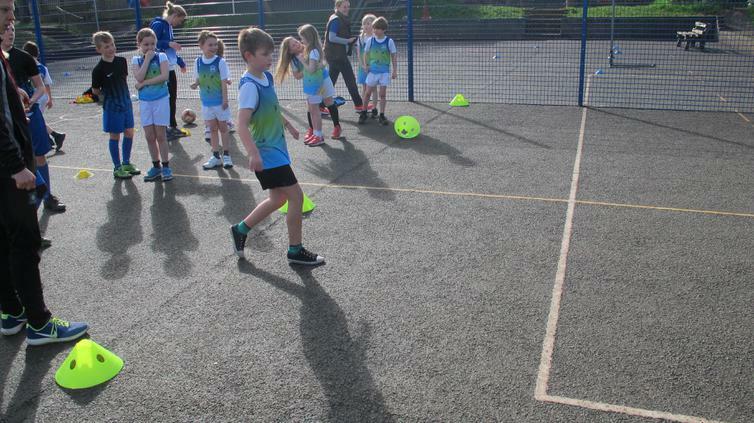 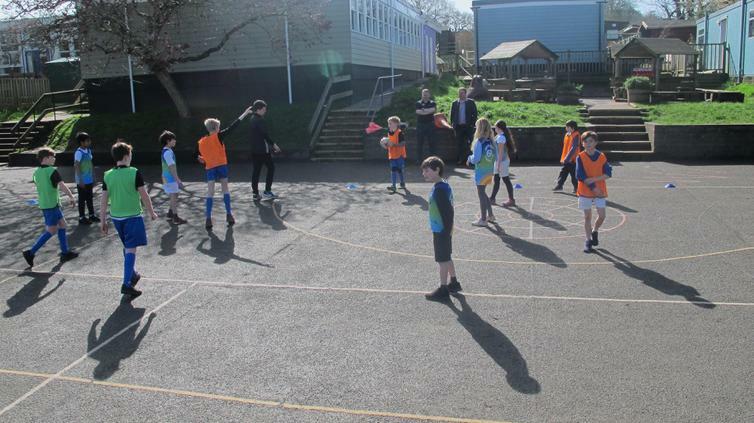 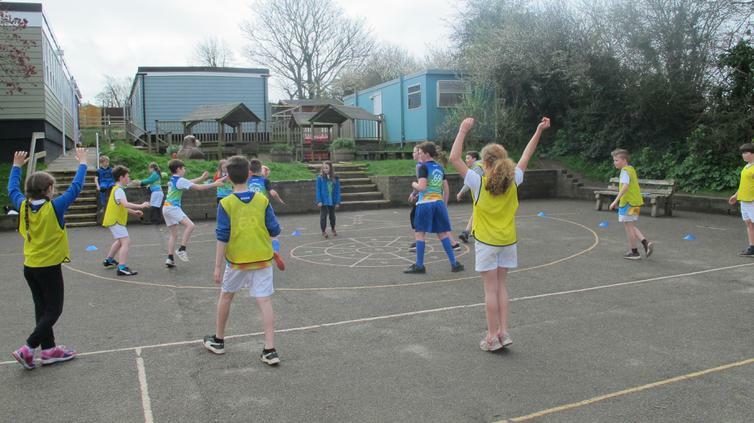 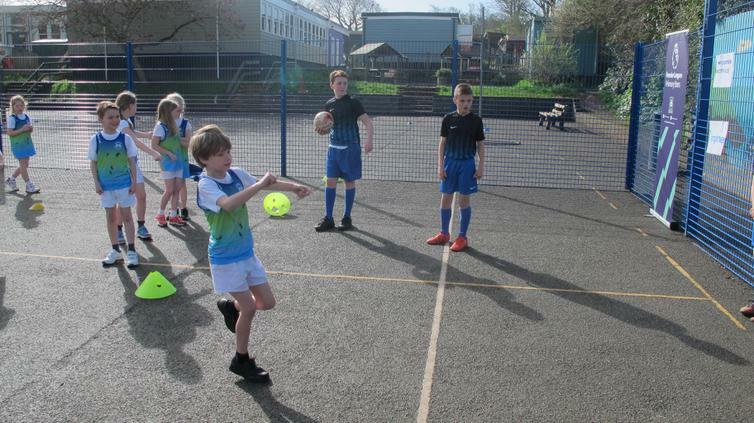 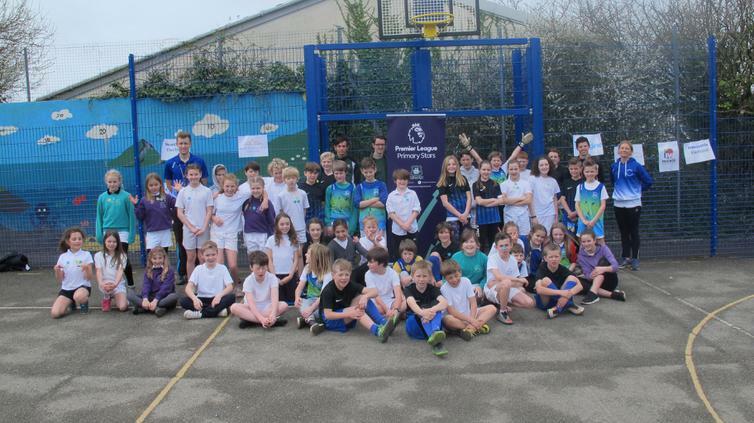 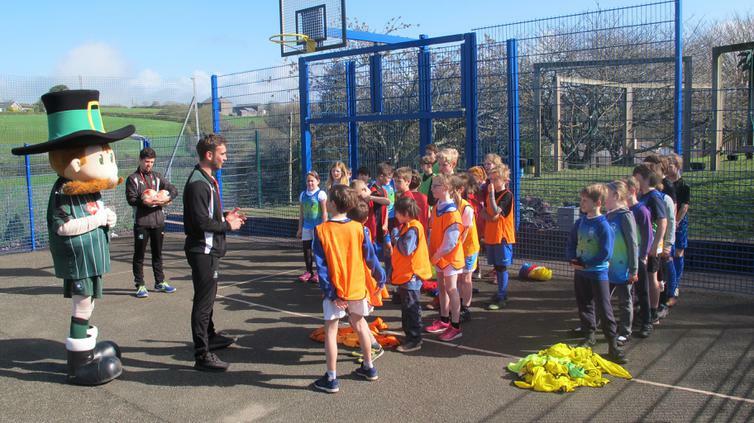 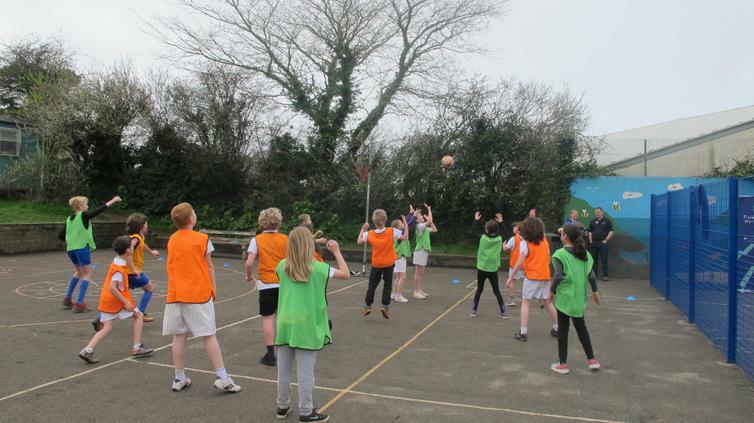 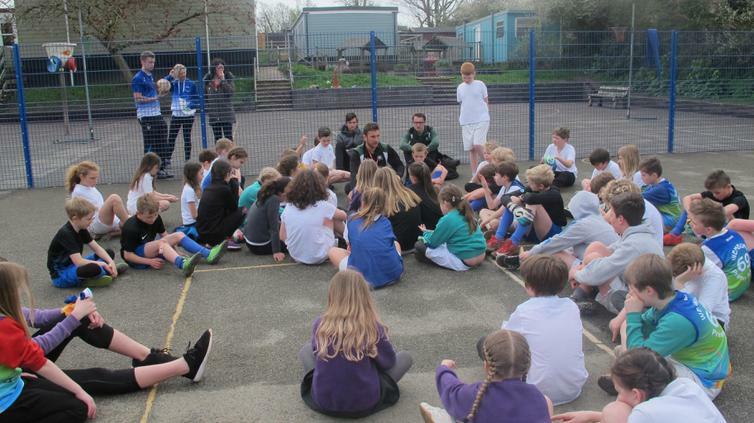 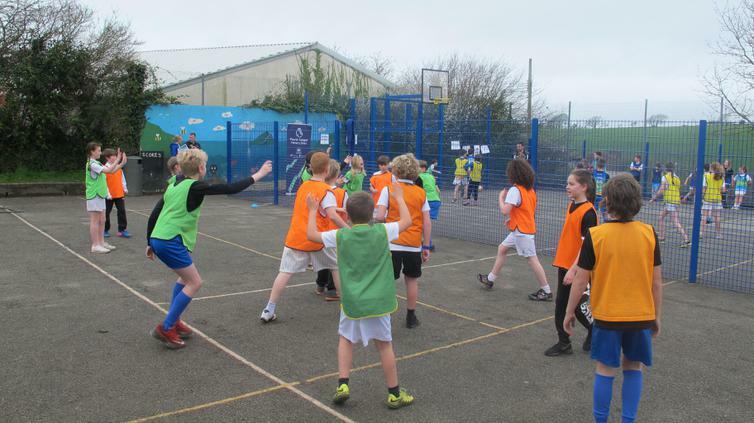 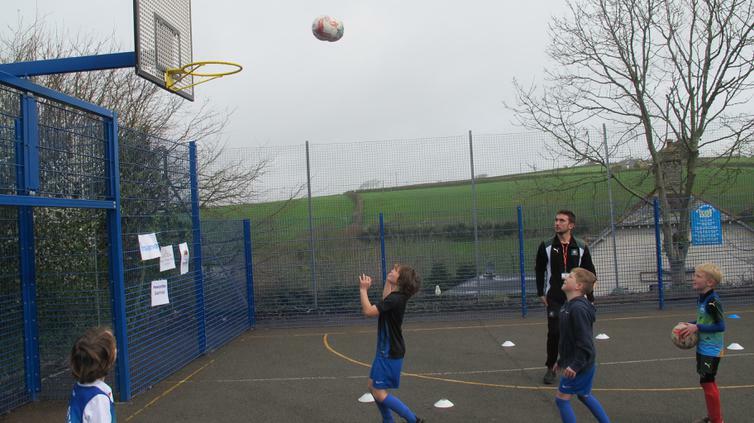 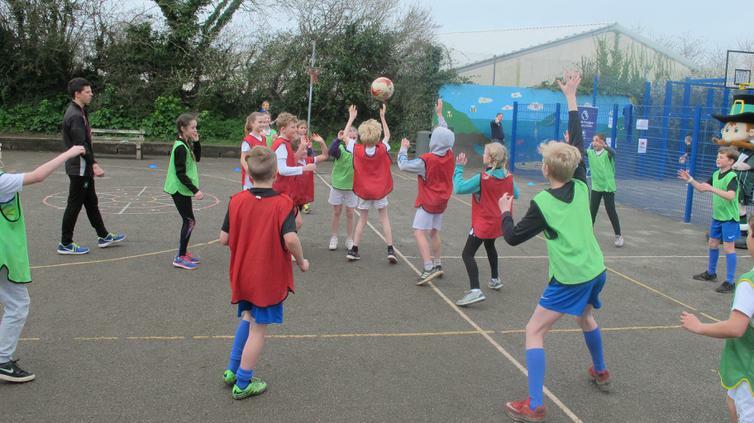 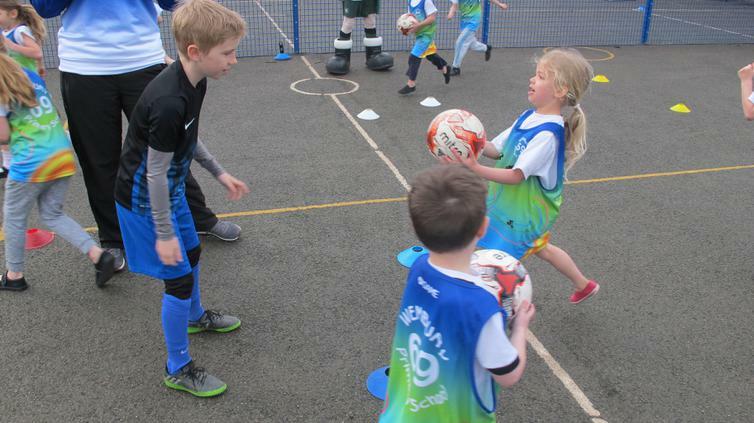 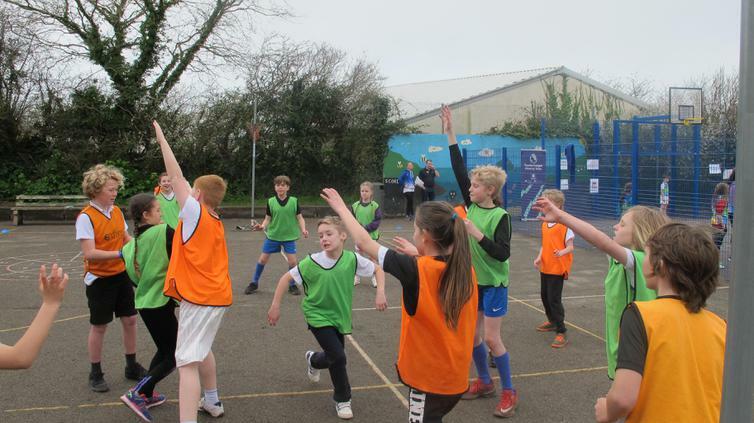 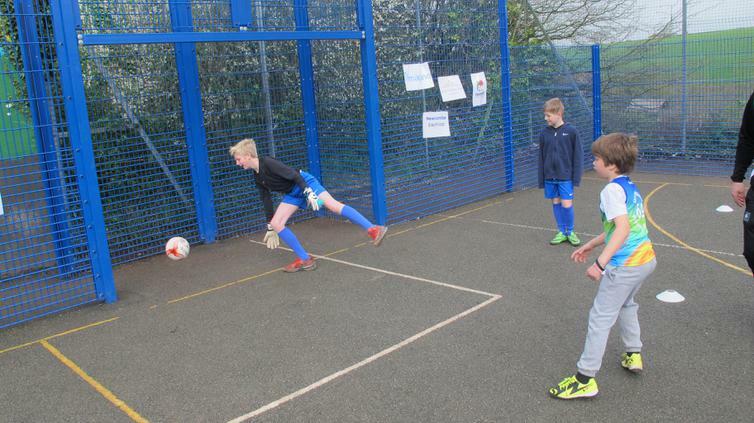 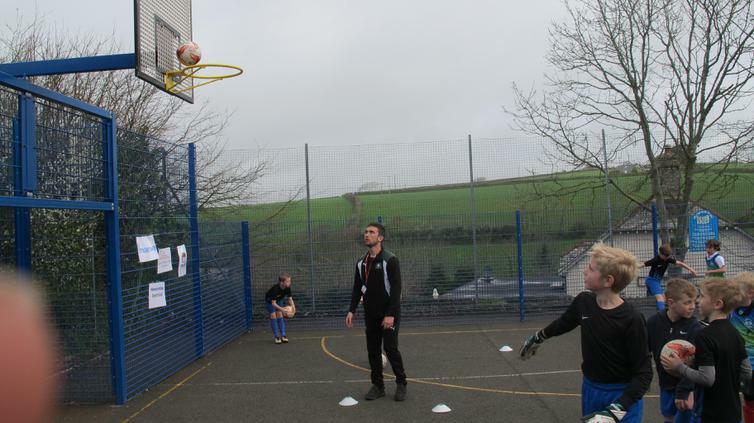 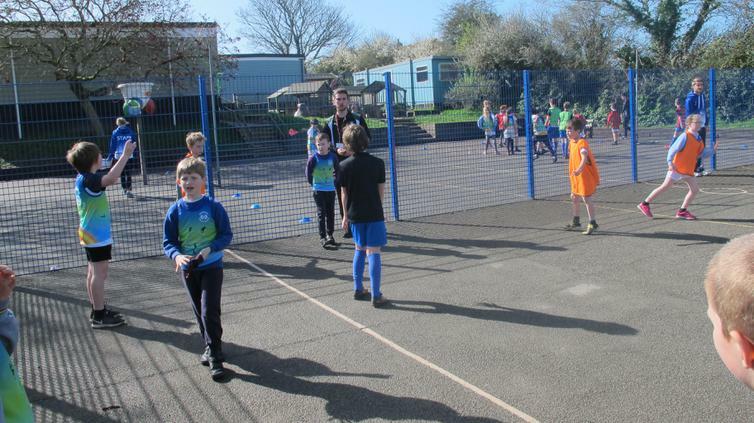 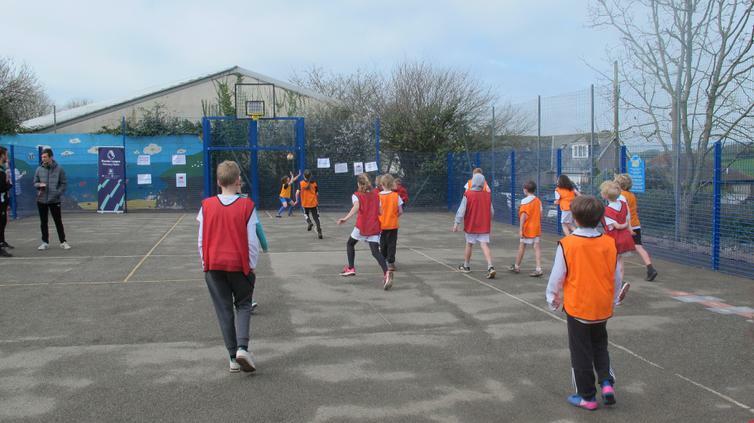 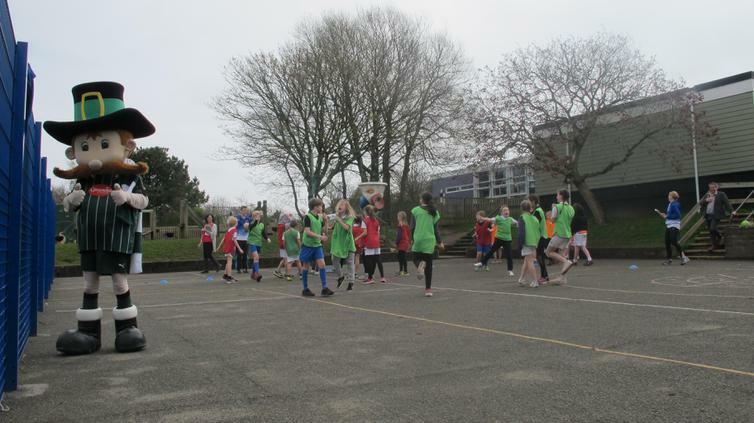 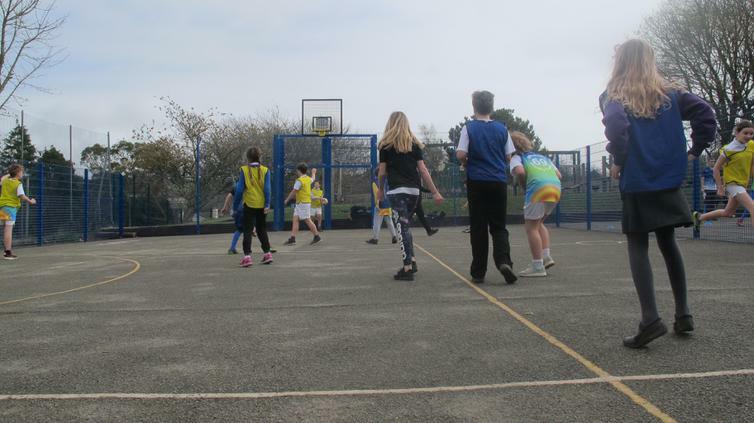 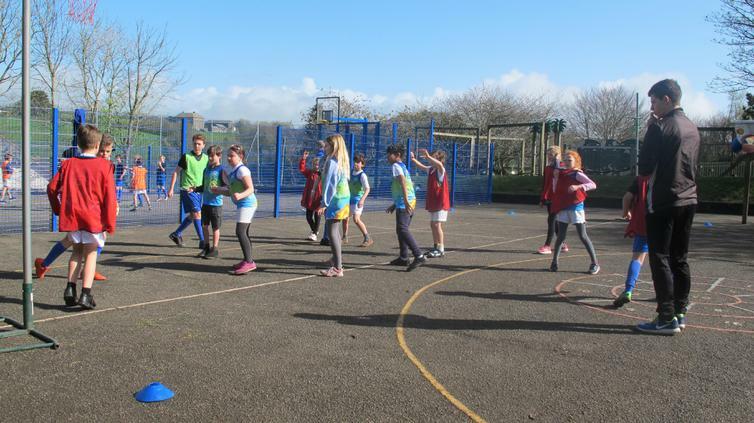 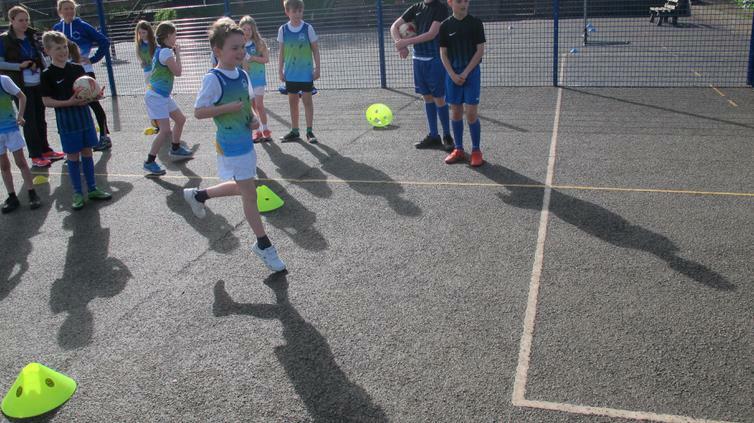 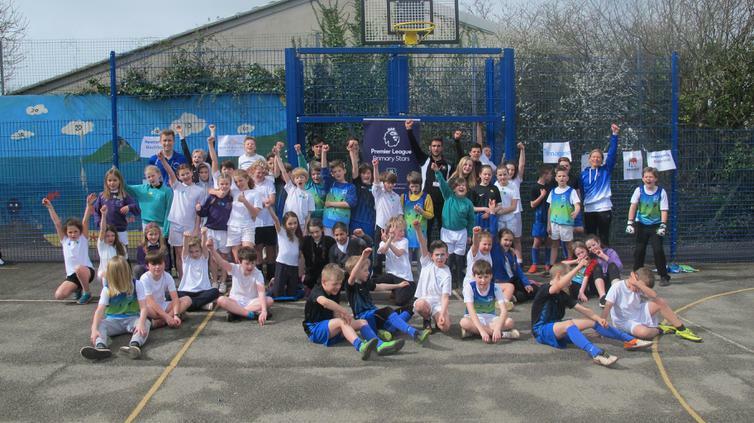 They ran a fabulous morning for the whole school with lots of fun activities, shots on goal against Pilgrim Pete and our star Year 6 goalkeeper Bram, shooting baskets and mini netball and football tournaments for the older children. 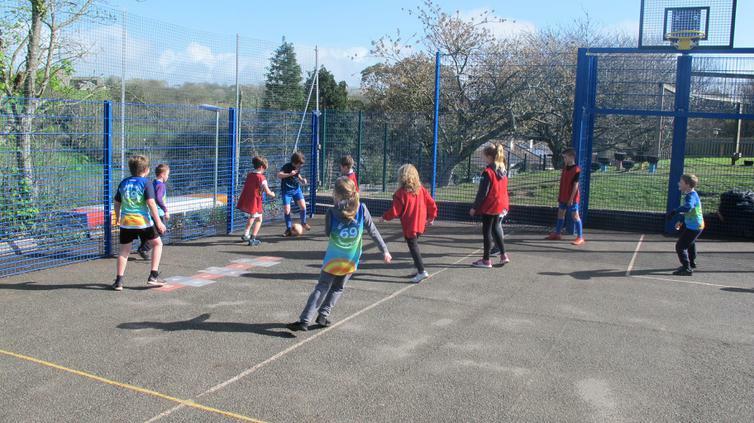 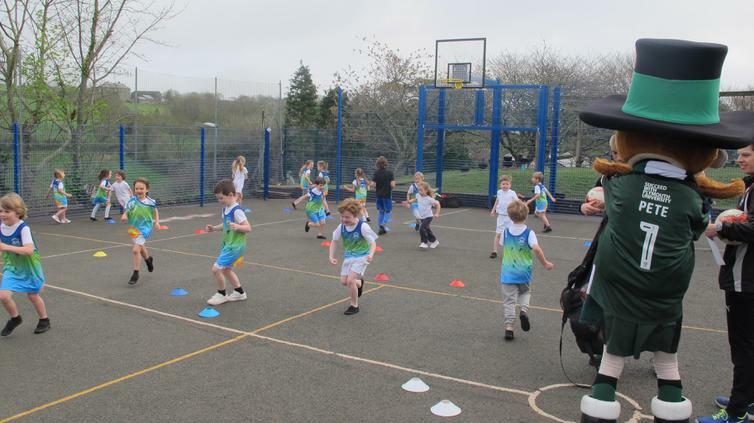 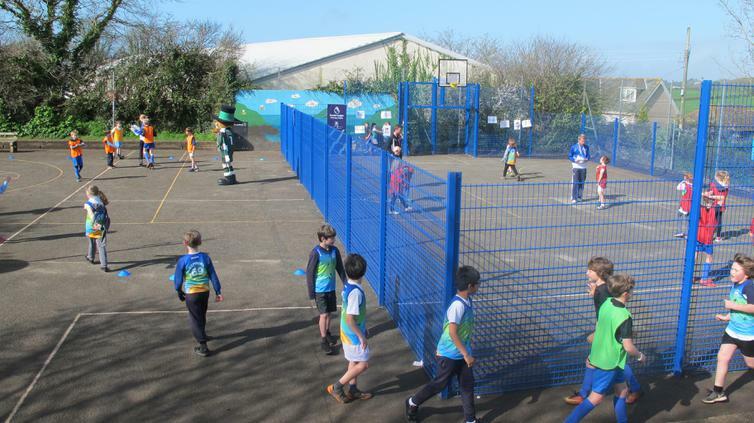 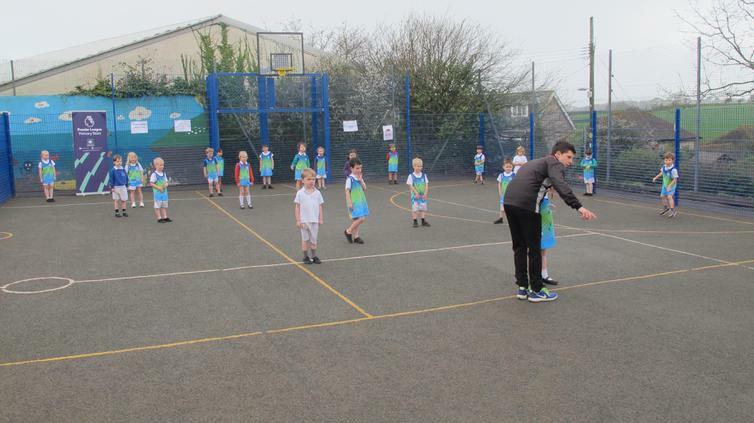 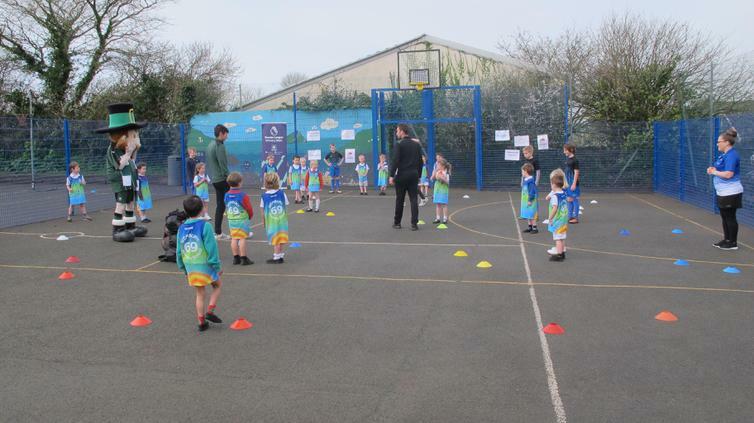 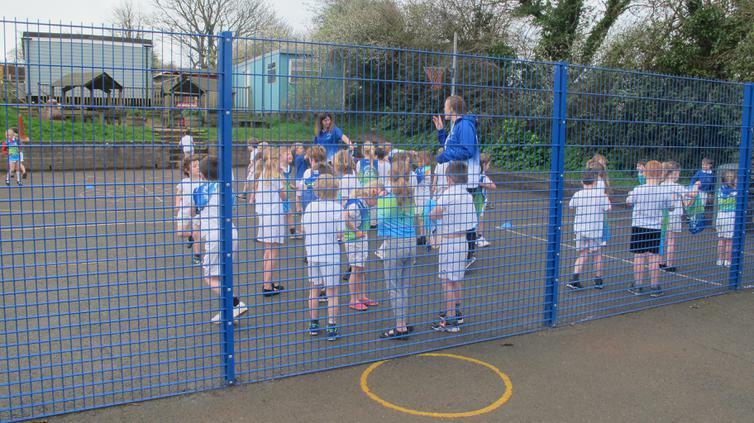 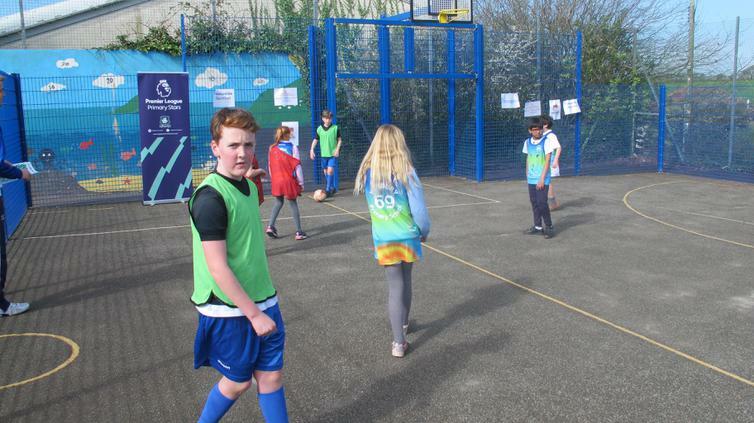 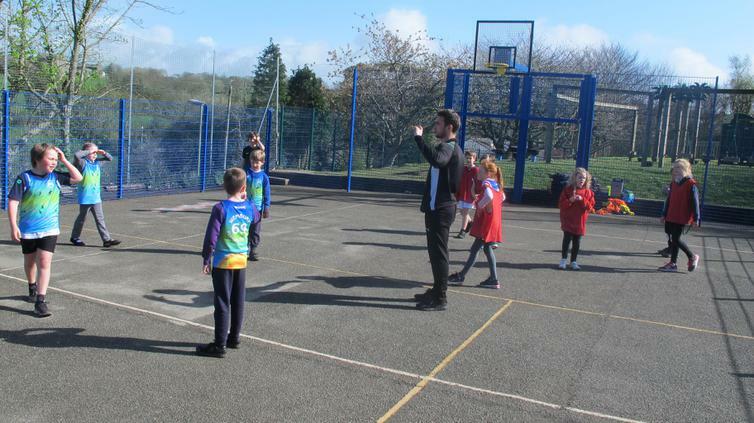 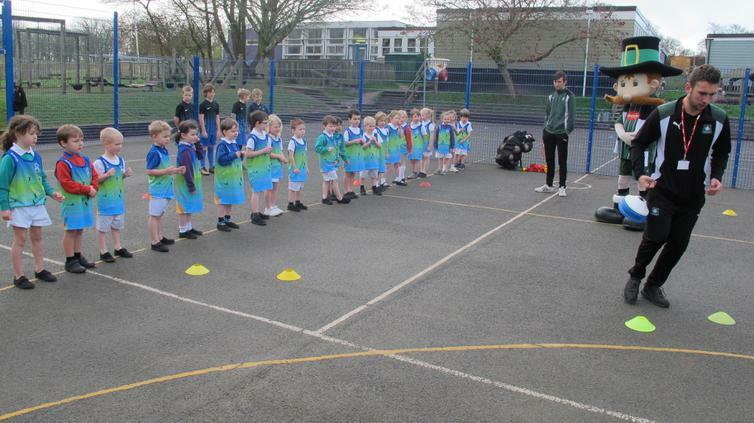 The focus of the morning was having lots of sporty fun but also to celebrate the fantastic MUGA as a resource and to launch our super smart and totally individual new sports kit for children and staff made by AGAME sports. 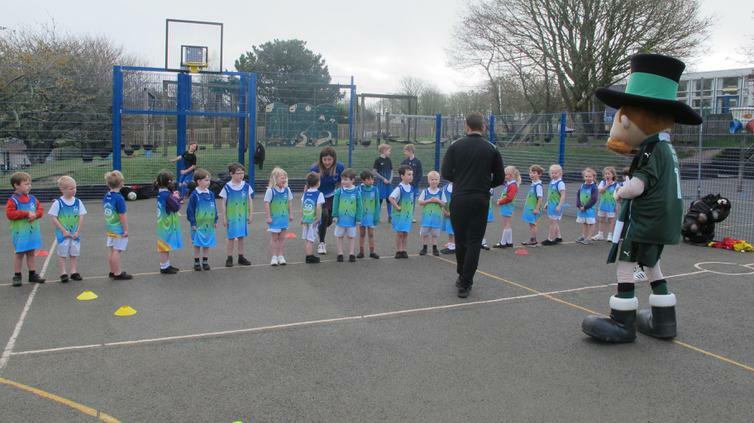 Earlier in the year, we asked a number of children to come up with some designs for the new sports bibs. 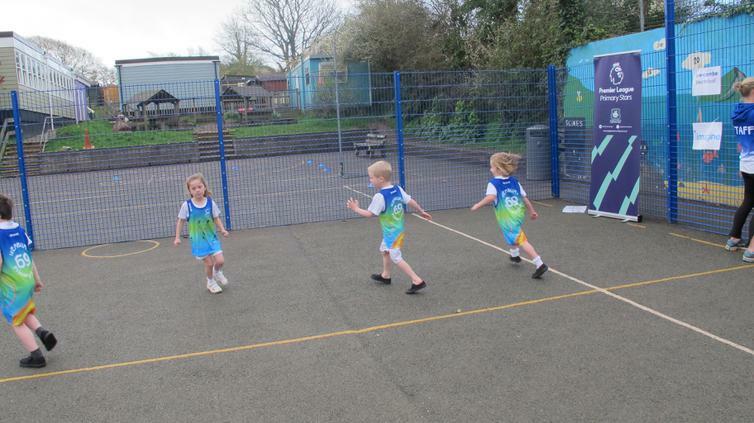 We took 3 of these designs from Mysha, Angus, Megan and put them all together, to come up with the truly spectacular bibs that they now are. 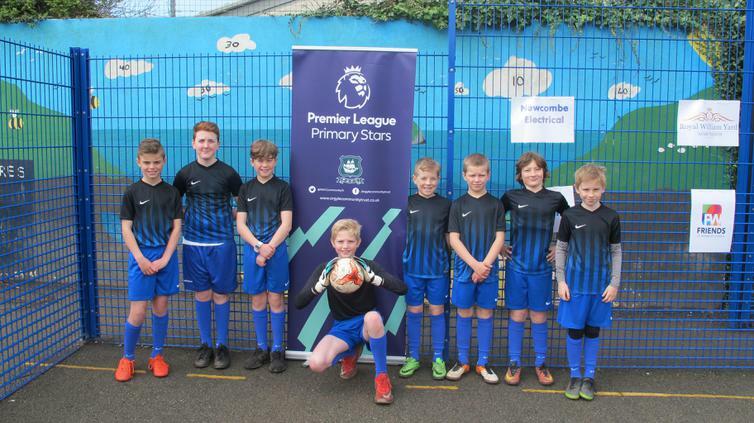 A huge thank you to Martin Luck from Imagine, Martin Newcombe from Newcombe electrical and James Shepherd from Royal William Yard apartments for sponsoring these. 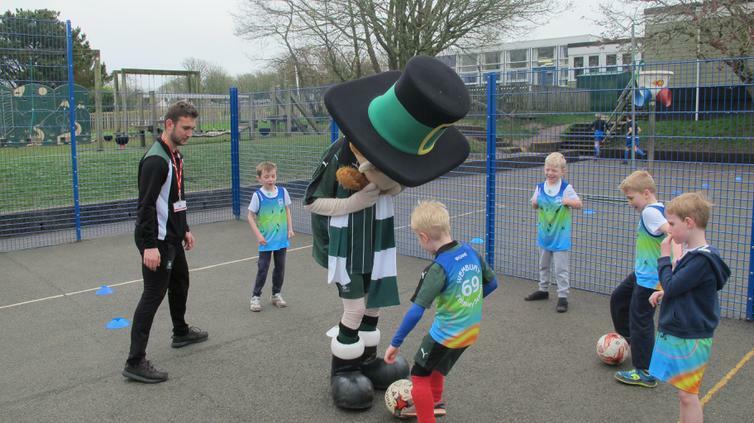 It is a very special thing to know we have relationships within our local community and that there are local businesses willing to support us in so many ways. 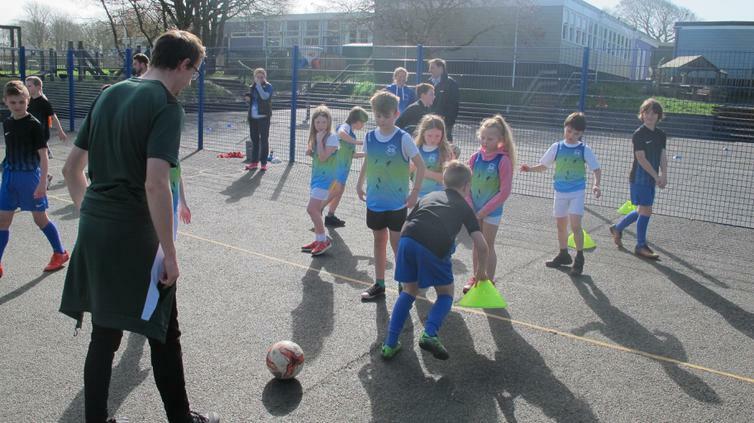 Our other new and very special team sports kit was also on show yesterday with our fabulous football and basketball teams acting as sports leaders and helping the events of the morning. 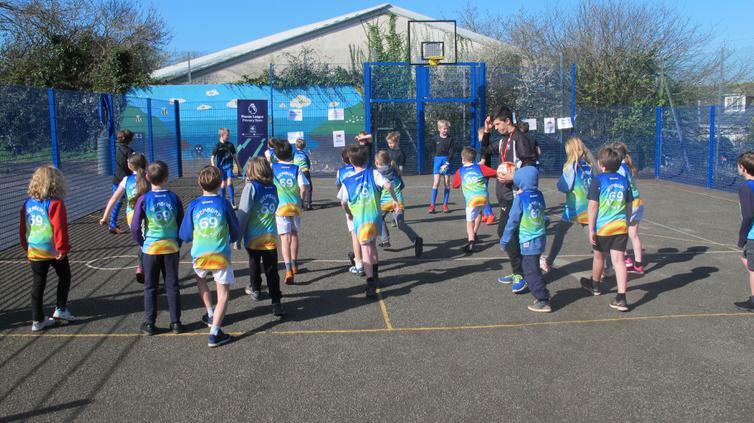 Thanks for these goes to our wonderful and always supportive FROWS, who were really helpful and happy to provide us with their hard earned funds to enable us to provide these for the teams. 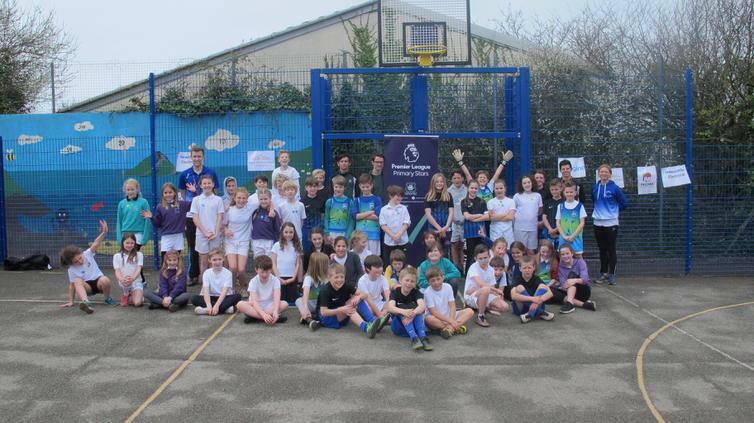 So, thanks all around to all that were involved and have supported our sports events this year. 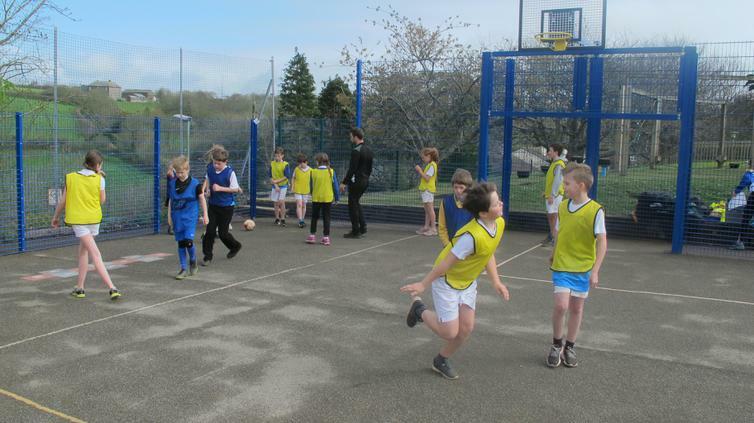 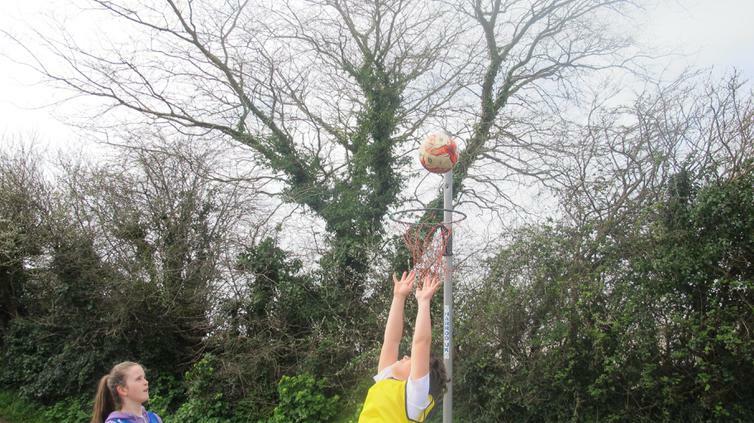 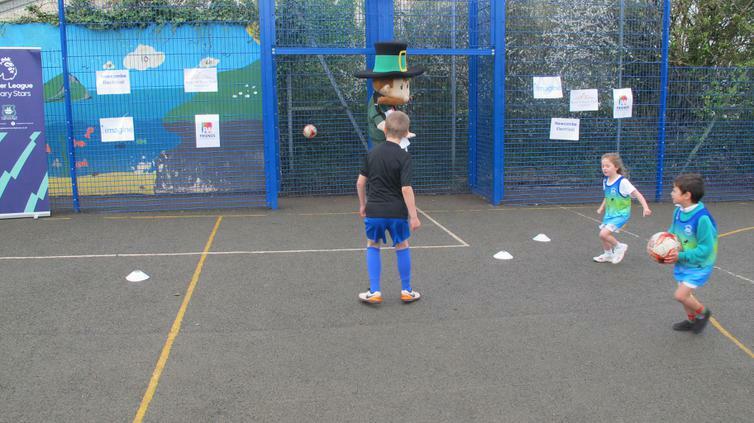 It was duly noted, when ofsted visited, that our children benefit from and really enjoy our sports provision. 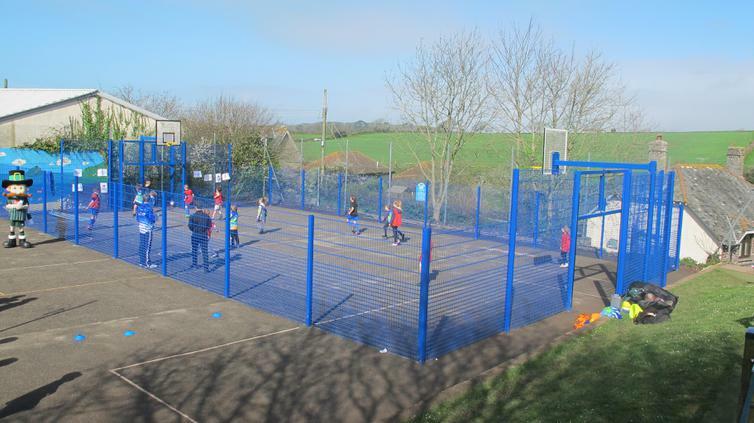 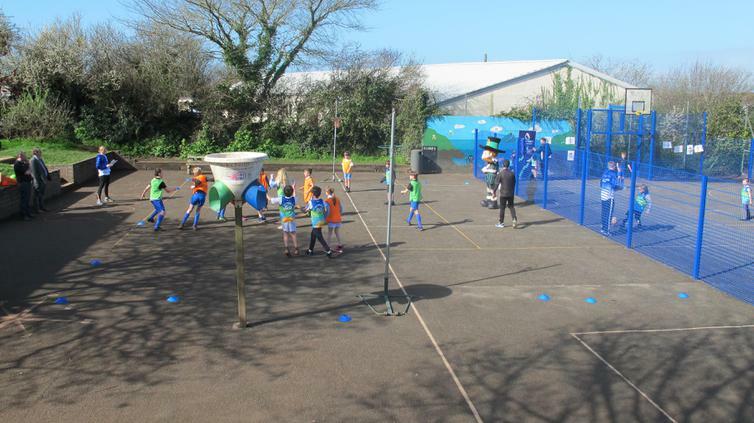 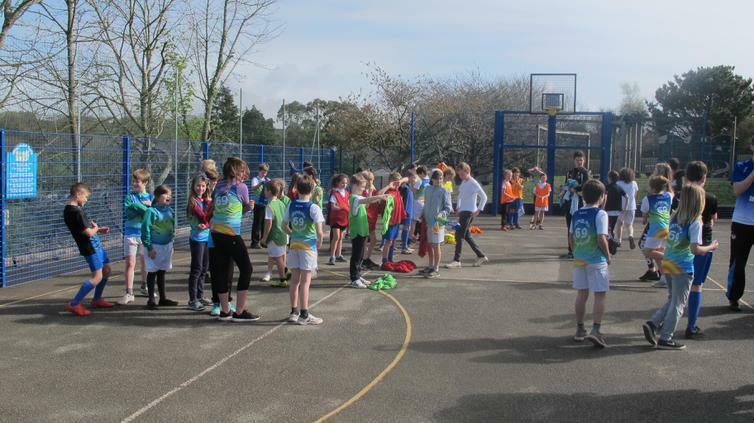 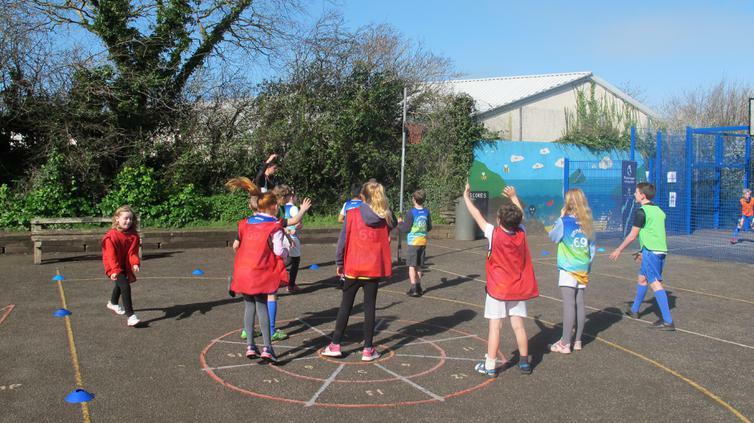 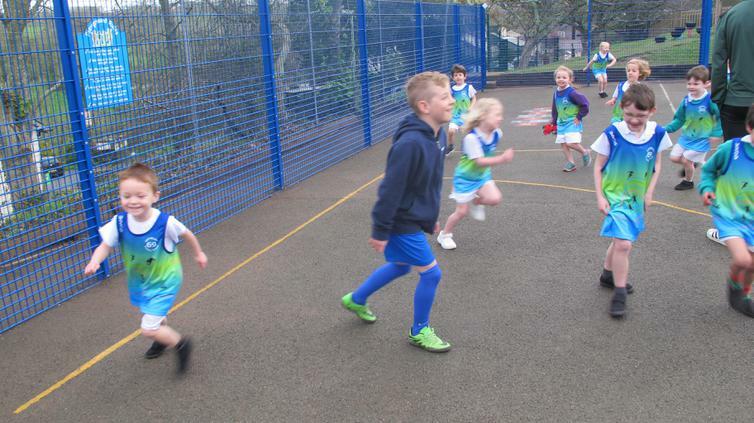 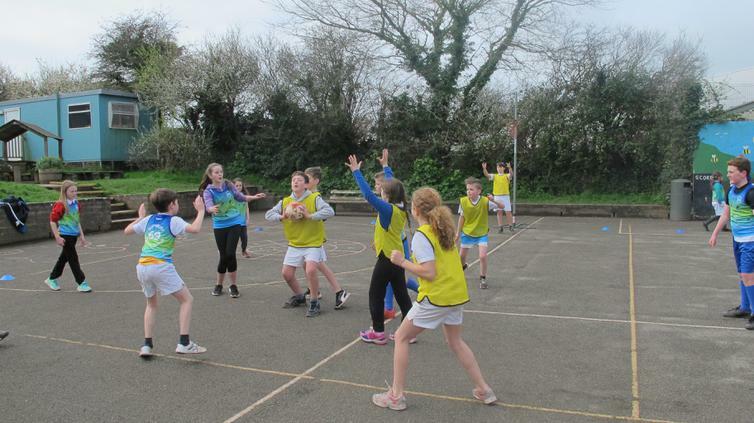 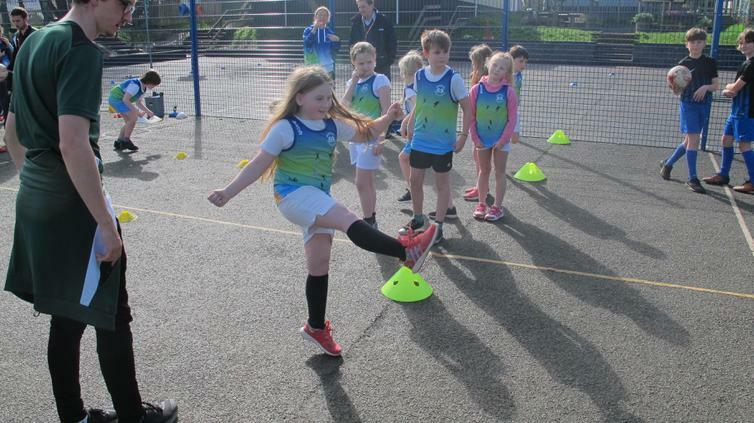 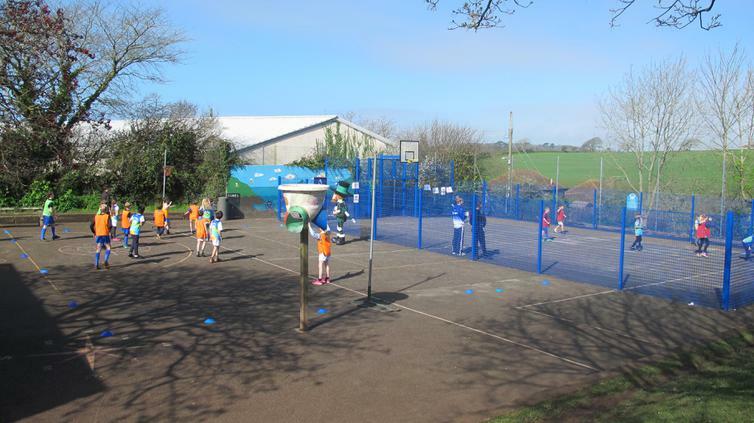 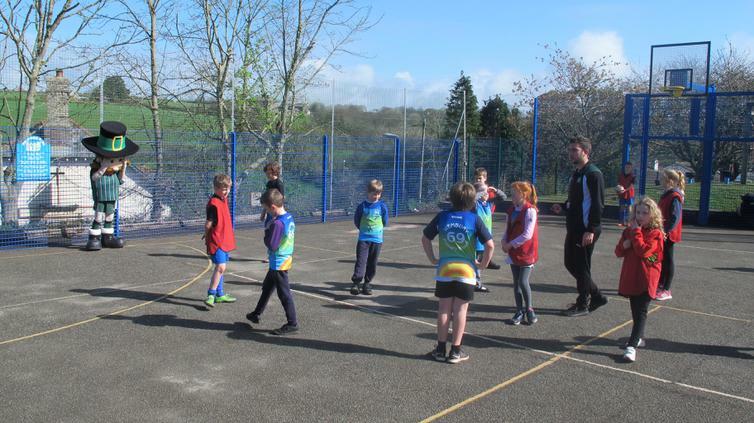 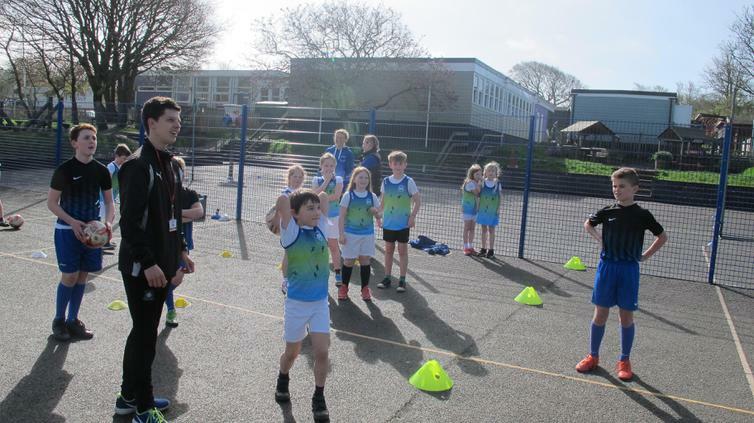 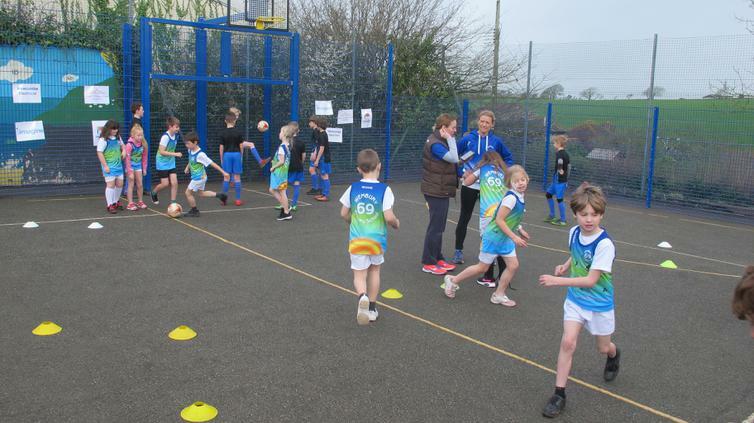 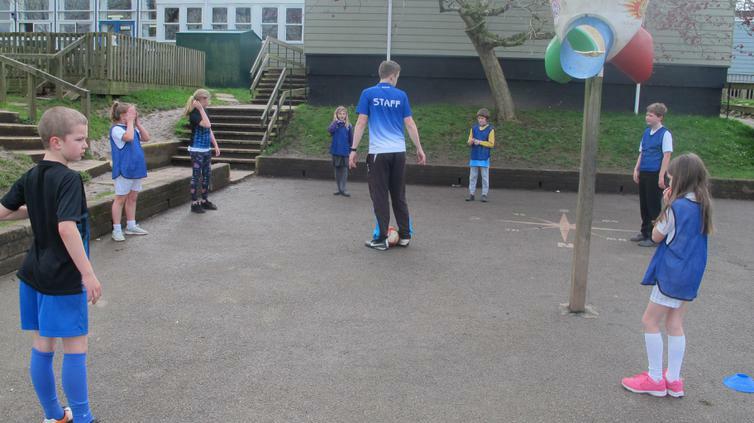 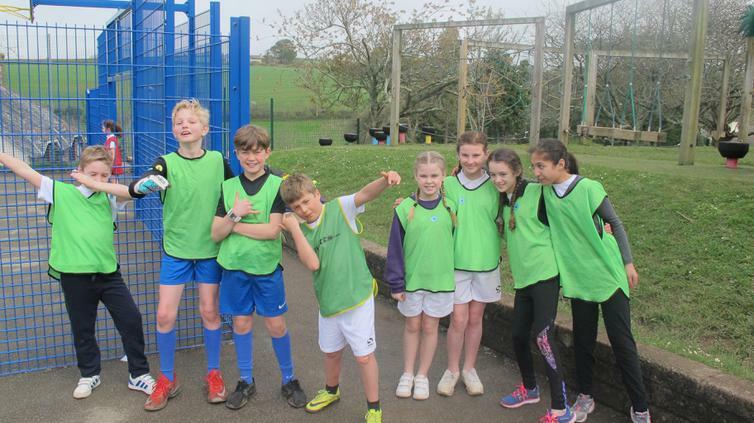 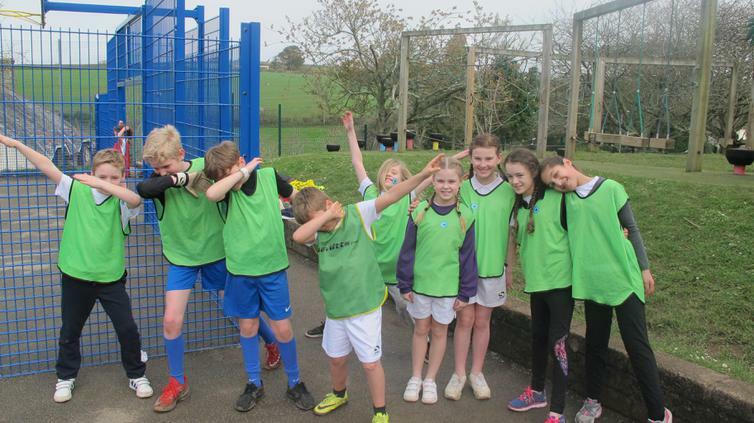 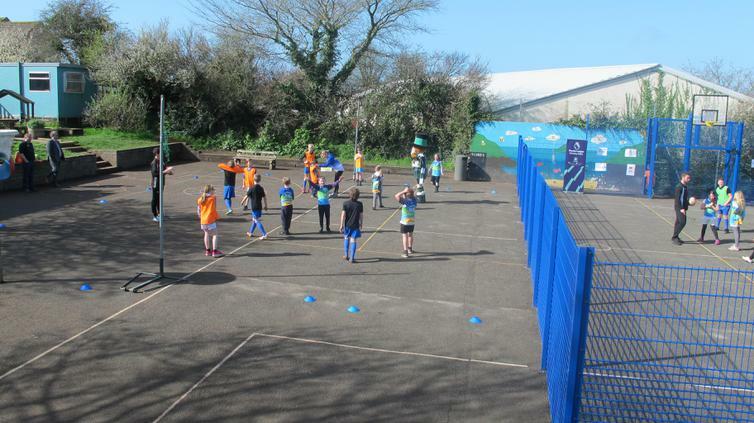 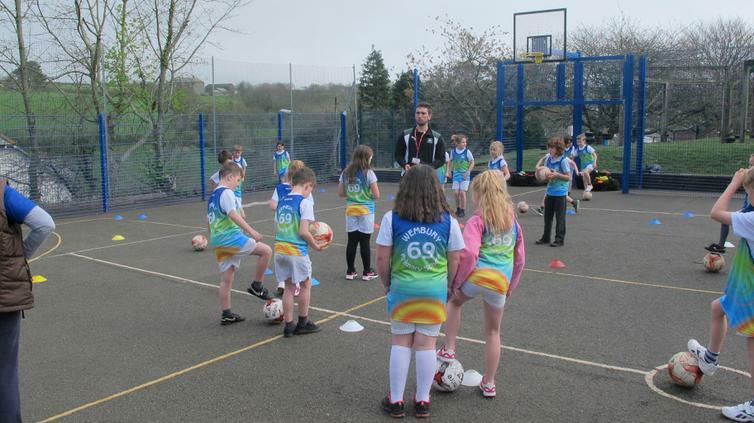 We will continue to provide as many intersting, varied, competitive and inclusive sports opportunities as we can to the children at Wembury, and now we can do this and really look the part!